Arena Financing The city of Glendale funded $180 million for the construction of the multi-purpose arena. The $180 million consisted of $30 million in general obligation bond funding, and $150 million in excise tax funding, which will be repaid through revenue generated directly from the project. Naming Rights Internet firm Jobing.com paid $25 million for 10-year naming rights in 2006. 1992-1996 - Attendance for Winnipeg Arena, Winnipeg, Manitoba, Canada. 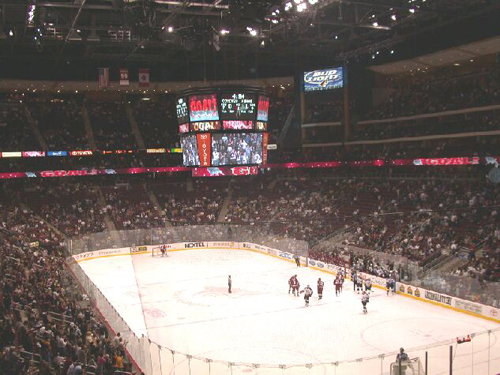 1997-2003 - Attendance for American West Arena, Phoenix, Arizona. City of Glendale officials have paved the way to keep the National Hockey League Coyotes in the Valley by agreeing to build the team a brand new, state-of-the-art arena at the Loop 101 Freeway and Glendale Avenue. Glendales Mayor and City Council and Coyote officials made the announcement today at a 10 a.m. press conference at City Hall. Earlier in the day, the City Council approved a memo of understanding with the Ellman Companies, owner of the team, that will keep the team in Glendale for 30 years. This is a huge victory for the city of Glendale, Glendale residents and for hockey fans throughout Arizona, said Glendale Mayor Elaine M. Scruggs. The arena and surrounding development will positively impact Glendale and will eventually become the heart of the West Valley. As part of the agreement, Ellman Companies will develop a mixed-use project of approximately 200 acres near the Loop 101 over a 10-year period consisting of three million square feet of entertainment, retail, office, residential and other commercial uses. The focal point of the project will be the multi-purpose arena that will serve as home to the Coyotes hockey team. Ellman will acquire the land, design and construct the arena and necessary infrastructure, including parking facilities. Upon completion of the arena in 2003, the city will reimburse Ellman for all associated construction costs up to $180 million and will become the owner of the arena. Both the Coyotes and Glendale will use the arena for other public uses throughout the year. The arena will be funded from taxes generated from the site, from General Obligation bonds earmarked for related projects, parking revenues and other dedicated revenue streams. Funding for this project will not affect current city services or delay any planned projects. March 10, 2004 - In 1996 the Winnipeg Jets relocated to the Valley of the Sun and were reborn as the Phoenix Coyotes. America West Arena in downtown Phoenix became their new home, but it was plainly evident that this could only be a temporary arrangement. America West was built for basketball - the home of the NBA Phoenix Suns, and its intimate seating configuration was well suited for hoops action but horrendous for hockey. The result - thousands upon thousands of obstructed view seats. Plans were launched again and again for different arena plans - the "Los Arcos" project in suburban Scottsdale was the most ambitious, combining a hockey arena with a shopping mall, but that plan unraveled. Time passed, and eventually a huge tract of land was acquired in Glendale, a suburb northwest of Phoenix. Construction for the Coyotes new home began in 2001, and on December 27, 2003, the puck was dropped at the new Glendale Arena for the very first time, ushering a new era for NHL hockey, here, in the deserts of Arizona. Finding Glendale Arena is a snap, as the venue is located directly off Loop 101, an arterial expressway which winds its away around Phoenix's northern suburbs. Wide boulevards and ramps provide access to an elaborate road system which takes you into the arena property itself. There is nothing surrounding the venue except for wide open spaces and plenty of onsite parking. Parking for Coyotes games is free. Let's repeat that... parking for Coyotes games is FREE, the only franchise in the four major sports to offer complimentary parking for fans attending the event. Public transportation to the games is non existent... Phoenix and its suburbs is a huge sprawling metropolis, with subdivisions, stores, schools and expressways going up so fast they can barely keep up. Car transportation around these parts is an absolute must. For now Glendale Arena rises out of the horizon in the middle of a huge vacant tract of land. But that is about to change, and in a very huge way. Right next door is the Arizona Cardinals new stadium, the framework going up and should be open in time for the 2006 NFL season. And Glendale Arena is the centerpiece of a massive project called "Westgate". This 6.5 million square foot development will consist of shopping centers, malls, entertainment venues, lofts, apartments, public park spaces, all with the arena serving as a focal point of an exciting synergy of (sub)urban planning. Shovels are ready to go into the ground soon, and when this project is done, will transform the arena project and this area into a vibrant and dynamic cityscape, unprecedented in sports venue construction. Patrons going to Glendale Arena today will enter, for the most part, through gate 4, the main entrance to the arena, and a nicely landscaped public plaza awaits, with floodlit palm trees, benches, a large video board overlooking the main gate, and temporary stages with entertainment, as well as booths selling souvenirs and local radio stations promoting their wares. All makes for a nice gathering place. And chances are good that you will be enjoying the warm and balmy winter weather that only Arizona can offer during hockey season. The designers of this arena took elements of other NHL venues which have opened in recent years and incorporated them here. The main entrance plaza looks strikingly similar to the pavilion at the Office Depot Center in Sunrise, Florida. In the seating bowl there are stacked party suites in each corner, reminiscent of the configuration at Nationwide Arena in Columbus. The upper deck concourse is at the top of the seating bowl, same as at the Xcel Energy Center in St. Paul, and an outdoor Party Deck is similar to those in Dallas and Tampa Bay, where visitors can enjoy refreshments in the sultry Arizona air. The outside of the building is brown and cooper colored granite with plenty of glass accents, and at night vertical neon strips shine brightly as a beacon, along with plenty of floodlit landscaping the venue looks as nice at night as it does during the day. The seating bowl is configured in two decks, and in between those decks are two levels of luxury suites. Seats are all colored wine red, and interestingly, the upper deck seating balcony has a very steep vertical pitch, putting those fans right on top of the action. A great way to enjoy the game! As is the case with the new venues, Glendale Arena has all the 21st century technological enhancements - 360 degree surround LED boards along the balcony with companion ribbon boards scrolling underneath the scoreboard. And speaking of scoreboard, this one is a wide screen four sided affair, with dot matrix boards stacked above. All very nicely presented. Out of town scores for the NHL and NBA are continually scrolled on a panel on the surround board. Nice, clean and brightly lit concourses throughout the arena, with soft recessed lighting and sparkiing terrazzo tile floors, but the color scheme does seem to lend itself to being a bit sterile looking. However on the positive side, most spots in the upper and lower levels offer views of the seating bowl and the action on the ice. Escalators are located on the north end of the building and take fans to all levels. The building is very easy to navigate, with plenty of wide public spaces. Food selection offers quite a variety of delicacies, and not just one that are near and dear to the local culture. Sausage Haus' offering brats, Delis with your favorite cold sandwiches, New York style pizza, even a Japanese cuisine stand all to be found at Glendale. And of course the aptly named Tortilla Flats with its selection of nachos, burritos, churros and other local fare. The team store is named "Coyotes Den", with a nice selection of merchandise and can be found near the main entrance. In addition to two levels of luxury suites, the Coyotes offer the Lexus Club, a second level seating perch in one end zone, with private entrance, nicely appointed bar area and premium food selections including a buffet. Patrons sitting along the glass have access to a separate club lounge at ice level, where fans can watch the players up close as they make their way onto the ice. An outdoor party terrace is also available to premium ticket holders. There is but one banner hanging high in the rafters at Glendale Arena, and that is for #99, Wayne Gretzky, now part of the Coyotes ownership group. The banner is done in Coyotes team colors. Thankfully, the Coyotes haven't raised some silly and ridiculous banner like "Most Wins In A Season When The Outside Temperature Is 80 Degrees Or Above", and for that, we are profoundly grateful. Hat Trick - to Phoenix Coyotes President and CEO Doug Moss, and also to Coyotes VP/Communications Rich Nairn, who went the extra mile to make our visit to Glendale Arena truly special. Doug is former Buffalo Sabres Prez, so when we emailed him and told him two roadtrippers would be coming from his old home town to pay a visit to his arena, he fixed us up with terrific club seats. Doug and Rich met up with us during the game, gave us their valuable time for an interview, and treated us with concession vouchers. Our humble thanks to these two guys and we are proud to induct Doug and Rich into the Ultimate Sports Road Trip Hall of Fame. Assist - speaking of former Buffalo people (and we run into Buffalo transplants EVERYWHERE, how come nobody ever moves TO Buffalo? ), former Buffalo radio personality Barry Buetel now works for the Coyotes as game host for the Coyotesvision telecast in the arena. We stopped by the in-arena studio and got a chance to chat with Barry for a few minutes before the game. Penalty, and Game Misconduct - To "Carlos", the usher in sec 111/112, which is lower level center ice. We meandered down there with about four minutes left in the game, figuring to grab some photos and then set up for our official "in the building" shot. Keep in mind, the home team was down 3-1, and the fan exodus was well underway. Well, surprise, surprise, Carlos would not let us pass, even though we held a more expensive seat then the ones he was so zealously guarding. When the game concluded, we blew by him, to snag our photo before the lights dimmed. Well Carlos comes down and starts chirping at us how "we're in the way" and to hurry and finish up. Or else WHAT, Carlos? The game is over! Everyone has left! "I'm just doing my job", he mutters. No Carlos, you're not doing your job. Your job is to make your paying guests feel welcome, not intimidated. Your job is to exercise a little discretion in application of the rules. A nice gesture would have been to hold the camera and take the picture, but your arrogant and disgusting behavior was an embarassment to your team and for us, a blight on what was otherwise a perfect evening. Assist - Don't let the above stories reflect on everyone we encountered in the building. We were warmly greeted when we entered, game day staff were more than happy to direct us around, and courtesy was the norm. Just a shame how a few Napoleonic bad apples could ruin it for all. Penalty - once again, our karma wilts in the intense heat of the Arizona desert as the Coyotes are dominated by Kings team in the hunt to make the post season. The final tally is 3-1 and the game was really not all that competitive. Hat Trick - To the Coyotes "HOWL". The howl is the signature chant when the home team scores, when the music is jacking up the fans, and is unique to this team. All very cool! Assist - An elaborate display of the Westgate project is near the main lobby, and murals along with a scale model of the setup are all nicely presented. Our assessment of these new venues always focuses on what is new and unique, a "signature element", so to speak, and it is in this department that Glendale Arena falls short. This building is nice, very nice, but what is here to set it apart from the rest? Not only are there no unique designs, but attractive features of other arenas were integrated into this venue, and what you have here is a mish-mosh that one could call "best of NHL arenas". What would we suggest? First of all, give the lobbies and concourses a proprietary decor. How about southwest design - Native American and southwest art, accents and patterns that are unique to this region (go see San Antonio's SBC Center). For now this building could be replicated in any city in America and one wouldn't miss a beat. Second, do something to celebrate the team's history. Backlit photo panels of Coyotes great moments, players etc., adorning the corridors would do much to personalize the place. And yes, do something to showcase the franchise's move from Winnipeg. The story is a compelling one, and the franchise has a great history that include the buzzwords Avco Cup, portrait of the Queen hanging in the rafters, and the "whiteouts", where fans dress in white for the playoff games, a tradition which made its way south. This story deserves a place here. Third. Will the arena be truly integrated into Westgate, or will it be just a building in the neighborhood? We like sports venues in active and vibrant urban settings, and how this evolves and comes together will be something to watch. Lastly, with people pouring into this region in droves to live here, there should be enough of a market to fill this place. For now, scoring a Coyotes ticket is no challenge here. For architecture, design, event presentation and future plans for Westgate, we still give Glendale Arena high marks. And the frosting on the cake has to be that FREE PARKING. Still shakin' our heads over that one! Can't wait for a return visit in Fall 2006 to see what it all looks like then! Glendale, Ariz. - The NHL hasn't taken over control of the Phoenix Coyotes, but it is taking an active role in trying to find new investors or ownership for the financially strapped franchise and is being kept apprised of any "significant" financial decisions the team makes, according to ESPN.com. The league also is trying to help broker changes to the existing lease with the city of Glendale in the hopes of making the situation more attractive new investors or owners. The web site cited has team and league sources for its report. Coyotes owner Jerry Moyes is in dire financial straights, with his outside business interests - most notably Swift Transportation, a large trucking firm - having been hammered by high gasoline costs, followed by the dramatic downturn in the economy. And although team officials say the club has never relied on Swift revenues to run the team, the Coyotes aren't in much better shape and are expected to lose another $30 million or more this season, on top of the more than $60 million they are reported to have lost the past two years. In short, Moyes wants out, a number of sources told ESPN.com. At the very least, he is in desperate need of an influx of capital to help in the continued operation of the team. Multiple sources told ESPN.com the biggest hurdle is the current lease with Glendale. The 30-year lease that accompanied significant municipal support in the building of Jobing.com Arena (the municipality put up $180 million of the $220 million price tag) has a number of problem areas as it relates to the franchise's ability to generate revenues. Take parking. The Coyotes, unlike most teams in the NHL, receive nothing from parking fees at the arena. Instead, they actually pay a surcharge of $2.70 per vehicle. That means instead of generating upwards of $10 million in revenue, they pay more than $2 million. Changing that part of the lease is one of the areas the NHL is trying to help renegotiate with the city. Ultimately, the league is hopeful it can help create strategies where both the municipality and the team can gain, as opposed to simply asking the municipality for concessions. The league is helping the Coyotes by providing detailed data from other franchises on revenue streams, especially those in non-traditional hockey markets. "Everybody agrees that we need to find a solution that works for both of us," team CEO Jeff Shumway told ESPN.com. The fact the league is significantly involved now suggests it is in a position to step in quickly to provide what might be described as bridge funding of the team's operational costs and maintain the integrity of the franchise. "There simply aren't any subtle ways to deal with this situation anymore," a source said. City of Glendale spokesperson Julie Frisoni said the city has a policy of not discussing ongoing negotiations. She did say that city lawyers have investigated the lease and believe that in the event of bankruptcy, the city and its investment are well-protected. It's not unprecedented for the NHL to take such a hands-on approach to assisting a team through troubled times. The situation in Phoenix has been likened to the situation in Ottawa a number of years ago, when Rod Bryden was trying to sell the financially troubled Senators. The league was instrumental in assuring a seamless transition to the current owner, pharmaceutical businessman Eugene Melnyk, and the Senators continue to be a successful franchise. First, ticket sales have increased about 77,000 from a year ago, team officials said. Television ratings have improved dramatically and if the team continues its strong play and can make the playoffs and take advantage of a few home dates (they were in seventh place in the Western Conference as of Tuesday), the bottom line will be significantly improved. The Coyotes are one of the biggest benefactors of the NHL's revenue-sharing program as well, and last year received $15 million, something that should also be attractive to potential investors. The NHL has approached head coach Wayne Gretzky about the potential changes to the ownership group and he has assured league officials he isn't going anywhere. Gretzky remains one of the pre-eminent names in pro sports, and knowing he's on board with the improving Coyotes, even if there is another ownership change, is a huge selling point, sources told ESPN.com. Although it's assumed Moyes is beating his own financial bushes looking for help, the NHL has also gone back to its list of potential buyers and is or has approached them about their interest in the Coyotes. Glendale, Ariz. - The Phoenix Coyotes' rent checks to Glendale are up to date after seven months of putting off paying the bills. The team suspended its payments on Jobing.com Arena last August due to contract negotiations, Coyotes and city officials said last week. Coyotes owner Jerry Moyes is in talks with investors about taking a majority stake in the NHL team. The team sent wire-transfer payments to Glendale just days after new reports about city financial documents showed that almost $300,000 in monthly lease payments and thousands more in other fees were missing. City and team officials did not disclose that payments had been made until questioned this week. "They are now paid up in full," City Manager Ed Beasley said. "They made their payments like they always said they were going to do." The Coyotes pay the city a $42,708 arena lease fee each month, plus a percentage of parking fees, sales tax, security costs and repairs. In return, the city took on $180 million in debt to build the arena five years ago. Coyotes President Douglas Moss said the team made the lease payments once certain issues that were a part of months of discussions had been resolved. Glendale, Ariz. - The Phoenix Coyotes have filed for bankruptcy, setting off a clash between the team, the league and potential new owners. The league was within an hour of announcing a new owner when the team filed for bankruptcy. Observers said bankruptcy was needed in order for the team to break its lease for Jobbing.com Arena. The bankruptcy filing said owner Jerry Moyes had agreed to sell the franchise for $212.5 million to Jim Balsillie, CEO of Research in Motion, creators of the BlackBerry, and a serial bidder for NHL teams. Balsillie reportedly wants to move the team to Ontario and reports say the sale is continent on approval for the move. The league responded by saying it had "removed Jerry Moyes from all positions of authority to act on behalf of the club" and that the NHL would appear in court. A hearing is set for 1:30 p.m. today (Thursday)in U.S. Bankruptcy Court in Phoenix. Hamilton, Ontario, is the city most often linked with Balsillie and an NHL franchise. Balsillie discussed plans with the city when he attempted to buy the Nashville Predators. Hamilton officials say they will meet with Balsillie's staff. The Ontario market is adjacent to areas served by the Toronto Maple Leafs and the Buffalo Sabres. Maple Leaf Sports Entertainment had no comment on the Coyotes' situation, but Buffalo officials hope the league will block a move. The bankruptcy filing shocked Glendale, which contributed $180 million for the $220 million arena that opened in 2003. For the city's investment, the team signed a 30-year agreement with an early-termination penalty of more than $700 million. As part of its effort to help the team survive, Glendale was working with Jerry Reinsdorf, owner of the Chicago White Sox and Chicago Bulls, and other investors to take over the team. Reinsdorf has a home in the Glendale area. City administrators were giving council members an update on hockey negotiations in a closed-door session when word of the bankruptcy surfaced. Glendale City Councilman Phil Lieberman said that bankruptcy was the one thing that could trump the penalty. Attorneys involved in the bankruptcy filing said a bankruptcy judge could overrule the NHL if the court finds the sale is in the best interest of creditors. The NHL may have to fight federal antitrust laws if it refuses to let the Coyotes move. In August, the Coyotes stopped paying the city rent, parking fees and most of its security costs at Jobing.com Arena, according to Glendale city records. The city was paid nearly $351,000 for past-due rent on Feb. 25, the day after the NHL agreed to loan the team an unspecified amount. As part of the loan agreement, the league had the right to take over the franchise if NHL loan was not paid. City officials say the league has promised them that all money owed will be paid. City records show that over the past four years, from August to April - the current time frame the city has not been paid - the Coyotes paid Glendale from $577,000 to nearly $2.5 million for parking and security costs. Most of that comes from parking fees the team collects as a surcharge on ticket sales, which allows those attending events at the arena to park for free. If the sale is approved, two secured creditors will be paid, with $35 million going to the NHL, which lent the team money in February to stay in business, and $80 million to SOF Investments, an affiliate of computer entrepreneur Michael Dell's MSD Capital. The rest of the money, or $97.5 million, would be divided among at least 40 unsecured creditors. Moyes has the largest claim, at $103.8 million, according to the bankruptcy filing. The filing also showed the team lost $73 million in the past three fiscal years and the team's arena management firm lost $20.1 million during the same time. Ticket sales were 41 percent to 43 percent of total revenue compared to about 50 percent for the average NHL team. Moyes, who made his fortune running trucking company Swift Transportation, owns nearly 92 percent of the team. He also is giving up his $206.5 million equity stake as part of the bankruptcy. Glendale, Ariz. - A U.S. Bankruptcy Court judge has told the NHL and the Phoenix Coyotes to sit down with a mediator and try to work out their differences before battling them out in court. The move means the team is likely to play its next season in Arizona. The sides will report their progress on mediation next week. If they are not successful, the judge said he would rule on the matter. That ruling could be influenced by a plan by one of the Coyote's minority partners who is attempting to put together a new ownership group that would keep the team in Glendale. The owner, Jim Brewlow, is not commenting on the effort. The judge also ordered both sides to present written arguments by June 12 regarding whether the team can be relocated to Canada, as current owner Jerry Moyes wants as part of the sale of the team, or stay in Glendale, as the NHL is trying to enforce. A hearing is set for June 22. The City of Glendale asked for an injunction to force the Coyotes to honor their lease and continue playing at Jobing.com Arena. No ruling was made. The NHL had argued that it has been making all the decisions for the team since November when owner Moyes surrendered control of the franchise. They say that decision gave Moyes no right to take the team into bankruptcy court. The league says Moyes signed numerous legal records that acknowledged only the league could approve the sale and transfer of the franchise, including a 2006 document when he took control of the team. The NHL did not officially terminate Moyes as Coyotes chief executive until May 5. That's when the Coyotes filed for bankruptcy and proposed selling the team for $212.5 million to Jim Balsillie, who plans to move the team to Hamilton, Ontario. The Coyotes have complained their lease with Glendale, which runs through 2033, hurts the team's finances. Bankruptcy would be one avenue for voiding the lease with the city. The team also has filed an antitrust suit against the NHL in order to force the sale. Thomas Salerno, an attorney for the team, has said that Moyes gave the league voting rights only and that operating agreements allowed him to file for bankruptcy protection. NHL bylaws prevent Balsillie from moving the team. In Hamilton, the franchise would compete with nearby teams in Toronto and Buffalo, N.Y.
Moyes made no apologies for considering a move of the team saying, in an open letter to the public, "I have a responsibility to all of the creditors of this business. No one other than Canadian businessman Jim Balsillie's company has offered enough to pay the creditors, which led to my initiating a court-supervised sale process. This process will be open and transparent, and all offers current and future must be fairly examined; guaranteeing an equitable offer." The NHL's legal filing shed light on the team's operations last season. The team has said it lost $73 million the three fiscal years ending June 30, but losses for the most recent season have not been disclosed. The Coyotes in August notified the NHL that Moyes, who since 2001 invested more than $300 million in the club, anticipated having trouble funding the team for the 2008-09 season. Later that month, the NHL agreed to advance the team $6 million, and the league ultimately lent the team more than $35 million, making it the team's second-largest secured creditor behind $80 million owed to a banking affiliate of computer entrepreneur Michael Dell. By Oct. 14, 2008, Moyes, who made his fortune in a trucking business that has been affected by the recession, told NHL officials he was "broke" and "done" funding the team, documents said. A month later, Moyes signed proxies with the league that gave NHL Commissioner Gary Bettman control of the club and prohibited Moyes from selling the team or placing it into bankruptcy protection, the NHL filing said. David Zimmerman, the NHL's general counsel, also negotiated for financial assistance with Glendale and others on behalf of the team. In August, the team stopped making rent payments to the city and the Coyotes owe Glendale about $2.5 million from arena-related expenses. The team did make a $351,000 payment in February, after the NHL provided more money to the Coyotes. The filing said Bettman also "exercised his proxy authority" and fired CEO Jeff Shumway on Jan. 23. Moyes was given the title of chief executive. Glendale officials were concerned about how a move would affect the city's bond ratings and arena revenues. The city was working with the league in its effort to sell the team to Chicago White Sox owner Jerry Reinsdorf. The city's fears were realized when, in a ratings update, Moody's analysts said they are "closely monitoring" the situation. "Should the Coyotes succeed in leaving Glendale," Moody's investors write, "this loss of rental and ticket surcharge revenues, along with diminished sales tax revenues generated by the retail establishments in and around the arena which comprise the Westgate development, will add to the budgetary pressure the city is experiencing as a result of the recession." Still, Moody's points out that the $180 million in bonds Glendale used to build the arena five years ago "remain well-secured." Instead of securing the debt solely with revenue from the arena and surrounding developments, Glendale pledged city-wide excise and property taxes to cover the payments, which potentially could buffer the loss of the Coyotes, according to Moody's. But the city promised taxpayers to pay it off with the business boost expected from the arena and Westgate. Otherwise, debt payments could cut into money for services to residents or reserve funds. Between 2005 and 2008, the city made good on that promise. Glendale paid $25.9 million on arena debt and brought in $27 million from developments directly related to the arena deal, according to city financial records. Like most cities, Glendale has had to cut its general fund dramatically to deal with the plunging economy. And the city plans to hold 9.6 percent of its general fund as reserve money in budget year 2009-10, though city financial guidelines call for holding 10 percent in reserve. Glendale, Ariz. - A U.S. Bankruptcy Court judge believes the issue of whether the Coyotes can move out of Glendale deserves an expedited hearing and has set June 9 to hear arguments. Judge Redfield Baum promises to rule shortly thereafter. Team owner Jerry Moyes rushed the franchise into bankruptcy in hopes of selling it to Jim Balsillie who has plans to move the team to Hamilton, Ontario. Meanwhile, the NHL was working on its own plan to sell the team to a group led by Chicago White Sox owner Jerry Reinsdorf who would have kept the team in Arizona. Balsillie was willing to pay $212.5 million for the franchise which is reportedly more than the Reinsdorf group. If the hearing had been delayed until June 22, as originally planned, it could have endangered a sale to Balsillie who set the end of June as a deadline to close the deal. The NHL, which has been supported in court papers by the NFL, Major League Baseball and the NBA, believes it should determine who can buy a franchise and where it can be located. Moyes disagrees, citing antitrust laws, and his desire to maximize the value of the team for its investors. The judge also ruled that the team will be auctioned June 22 if the ruling goes in favor of Moyes or Sept. 10 if the NHL prevails. The NHL says it is open to bidders who want to keep the team in Glendale. The City of Glendale wants to keep the team in Jobbing.com Arena in order to protect revenue streams for its bonds. Phoenix, Ariz. - A federal bankruptcy court judge has rejected a June 29 deadline to meet Jim Balsillie's offer to buy the Phoenix Coyotes and move the franchise to Canada. Balsillie says he's not finished with his efforts to acquire the team. The city of Glendale, which holds the debt on Jobing.com Arena, and the NHL opposed the sale to Balsillie. Owner Jerry Moyes sought to sell the team for $212.5 million while the NHL was putting together a plan that would have resulted in a lesser amount. The judge dismissed that timing as untenable, considering the complexity of issues that need to be resolved. The league says it has four potential buyers who would keep the team where it is. The judge's decision, at least for now, makes moot arguments by the NHL that the league should decide where teams can be located and Moyes' claim that such actions violate anti-trust laws. It also sets Glendale's concerns aside because no move is on the table. A move is still possible if the judge decides to proceed with the bankruptcy proceeding and auction off the franchise. The judge suggested that Balsillie and the NHL work together in a mediation process. Balsillie's representatives said they are open to that and to discussing a possible relocation fee to the league. The league believes a fee is appropriate because of the impact a move would have on the Toronto Maple Leafs and the Buffalo Sabres. "We still think there is enough time for the NHL to approve Mr. Balsillie's application and move the team to Hamilton by September," said a spokesman for Balsillie. "The court invited mediation on these issues and Mr. Balsillie is willing to participate in such mediation ..."
While noting that the case raised many unique legal issues, the judge sided with the league on most of the issues. The judge said the Coyotes had a contract to play in Glendale, a Phoenix suburb, and Balsillie's offer would violate that contract. "Simply put, this court disagrees with the assertions by [Balsillie's lawyers] that the relocation requirement can be excised from the 'contract' because it violates some portion of [the bankruptcy code] or is unlawful under the anti-trust claims alleged by [Balsillie]," the judge wrote. The judge added that Balsillie's offer had to satisfy the relocation fee issue. He said, "this apparent economic right of the NHL must be appropriately resolved for the [offer] to satisfy the requirements [of bankruptcy law]." Toronto, Ontario - Papers filed as part of a bankruptcy filing by Phoenix Coyotes shows that the value of an NHL expansion franchise is about $265 million. The estimate came from the club's majority owner, Jerry Moyes, who put the club into Chapter 11 protection and wants to sell it to Canadian Jim Balsillie. There are no details as to how Moyes made the calculation. The figure surfaced in a letter that the NHL's general counsel, David Zimmerman, sent to lawyers representing Balsillie and Moyes. In the letter, dated July 2, the league asked for information pertaining to Balsillie's request to move the club to Hamilton. Zimmerman wants census data for Hamilton and financial statements for Copps Coliseum along with renovation plans for the arena. Balsillie has submitted a $212.5 million bid for the Coyotes but it can't be considered until the bankruptcy court holds an auction on Aug. 5 for buyers who will keep the club in Phoenix. So far only Chicago businessman Jerry Reinsdorf has made a proposal, worth up to $148 million. If that auction doesn't yield a sufficient bid, a relocation auction will be held on Sept. 10. If Balsillie is allowed to move the club, he will have to pay a relocation fee to the NHL. Based on Moyes's calculation, Balsillie would pay around $52.5 million. That is far below what the NHL has suggested. Meanwhile, a group of Canadian and American businessmen plans to submit an offer soon to purchase the Coyotes for more than $140 million. The group is led by Daryl Jones, a manager director at Research Edge LLC in New Haven, Conn. Jones, who is Canadian, said group members met with NHL commissioner Gary Bettman and deputy commissioner Bill Daly to go over their plans for the Coyotes. Jones said his group is still finalizing its offer, but it will be comparable in value to a proposal put forward by Reinsdorf. Reinsdorf's offer is conditional on a new arena lease. Jones said his group also wants a new lease for Jobbing.com Arena, and it has held several meetings with officials from the City of Glendale, the Phoenix suburb that built the facility in which the NHL team plays. The group must submit a formal bid by July 24 in time for the U.S. bankruptcy court's auction on Aug. 5 for bidders interested in keeping the club in Phoenix. So far, only Reinsdorf and Jones's group have come forward. If that auction fails, another one will be held on Sept. 10 to relocate the club. Glendale, Ariz. - An American group is the only formal bid submitted to buy the Phoenix Coyotes and keep the team in Glendale, Ariz., but a new Canadian group has been working on a similar plan If an acceptable agreement can be reached with one of the groups, the team will remain at Jobing.com Arena. If not, the team could be headed out of town when a new set of buyers offer their bids with the freedom to move the franchise. The decision will be made in U.S. Bankruptcy Court where bids are filed, but the NHL has made it known that it favors a bid from a group led by Jerry Reinsdorf, owner of the Chicago Bulls and White Sox. In a special meeting Board of Governors meeting this week, Reinsdorf's bid was approved. The Canadian bidders include Anthony LeBlanc and partners Keith McCullough and Daryl Jones, a couple of Canadians who played hockey together at Yale University and now run an investment firm in New Haven, Conn., called Research Edge. The NHL did not consider the bid, calling "incomplete," but it recommended to the group that it continue its efforts. LeBlanc, 39, left RIM last year after nine years with the company, where he was vice-president of global sales. At first, he pursued a few investment ideas and launched another hockey venture - bringing an Ontario Hockey League team to his home town of Thunder Bay. McCullough, who is also from Thunder Bay, heard about the OHL idea and offered to help, along with Jones. They were on track with those plans until May 5, when Coyotes' majority owner Jerry Moyes put the club into bankruptcy protection and announced a $212.5 million deal with Jim Balsillie who wants to move the franchise to Hamilton, Ontario. Reinsdorf's group has offered $148 million for the Coyotes and also wants a new arena lease. LeBlanc believes the financially-struggling club can be successful. He cites small changes such as charging for parking, putting a restaurant in the arena and changing marketing tactics as first steps. If they win the auction with its $150 million offer, the group plans to move the Coyotes' farm team, the San Antonio Rampage, from Texas to Thunder Bay and help build a new arena. It also wants to bring five of the Coyotes' regular season games to Saskatoon or Halifax. The group has talked with officials from both cities and is leaning toward Saskatoon, although no firm deal is in place. If the National Hockey League approves the plan, the Coyotes would play "home games" in Saskatoon's 11,300- seat Credit Union Centre against the Montreal Canadiens, Calgary Flames, Edmonton Oilers, New Jersey Devils and Vancouver Canucks. If the Coyotes make the playoffs, the Coyotes would hold some of those games in Saskatoon as well. NHL deputy commissioner Bill Daly said Balsillie's bid was rejected under bylaw 35 of the league's constitution. That section says the league can reject potential owners if it does not believe they are of "good character and integrity," as well as for financial reasons. Balsillie says he will continue with his efforts to acquire the team and noted that Bankruptcy Judge Redfield T. Baum told the NHL earlier that because it approved him as an owner when he tried to buy the Pittsburgh Penguins in 2006, it could only reject Balsillie as an owner if there was a "material change" in PSE Sports & Entertainment, the company Balsillie formed to handle the Penguins and Coyotes bids. Daly responded by denying Balsillie had been approved as an owner in 2006. Balsillie is hoping Judge Baum will accept his bid because it offers $64.5 million more than Reinsdorf's bid. The Reinsdorf bid is largely based on the assumption of debt. It is also conditional on working out a new lease and revenue concessions from the City of Glendale, plus concessions from the major creditors. Glendale, Ariz. - The accidental leak of confidential financial information may lead Jerry Reinsdorf to withdraw his $148 million bid to buy the Phoenix Coyotes. Reinsdorf is the only official bidder for the franchise who wants to keep the team at Jobing.com Arena. Judge Redfield Baum also this week opened the bidding to all interested parties. Previously he had separated bidding deadlines between those who want to keep the team in Glendale and those who wanted the option to move the franchise. At the request of the league and the city, Judge Baum agreed to postpone the auction of the team to Sept. 10. Glendale and the NHL said they needed the additional time to regroup with Reinsdorf's group and another bidder. The confidential information was posted publicly through the court's Web site by attorneys for Coyotes owner Jerry Moyes. The document described proposals Reinsdorf has made during negotiations with Glendale on how to raise millions in yearly team revenue. The team has lost as much as $30 million each season. Almost immediately, Reinsdorf's attorneys expressed "complete disbelief that such confidential information was released" and "threatened to walk away from the bidding process," Glendale officials told the court in filings. The disclosure "undermines the ability to get a deal negotiated with any bidder," including a second buyer group, Ice Edge Holdings, the city said. If bidders walked away, the damage would be "staggering for Glendale." 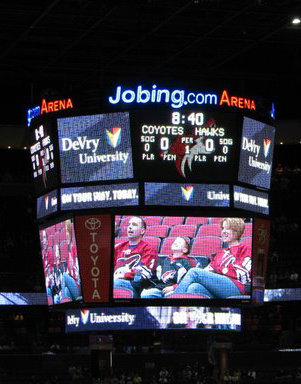 The city owns Jobing.com Arena, where the Coyotes play, and invested about $180 million in the facility, a key feature in Glendale's sports and entertainment district. The leaked confidential filings say Reinsdorf has asked for a special taxing district to be created in the district that would provide as much as $23 million next fiscal year through a voluntary surcharge on retail sales. The Arizona Cardinals, which play in nearby University of Phoenix Stadium, have filed papers with the court objecting to the district. Additionally, if the team were still losing money after five years, Glendale would have to pay Reinsdorf $15 million for each year of losses or allow the team to be sold and relocated, according to Moyes' filing. There was no indication that Glendale officials had agreed to any of these conditions, nor has a City Council meeting to approve such a deal been scheduled. It was unclear whether the leak was intentional or not. It appears Moyes' attorneys indicated before filing that they planned to submit the documents to the judge under seal. Moyes hopes the court allows him to accept a $212.5 million offer that includes a plan to move the team to Ontario. Moyes allegedly took the team into bankruptcy as a way of accepting that offer. Glendale, Ariz. - Jerry Moyes, owner of the Phoenix Coyotes, has said through his lawyers that he's sorry for the accidental release of sensitive financial information about the club. The information was posted on the U.S. Bankruptcy Court's web site. One of the bidders for the team, Jerry Reinsdorf of Chicago, says the release makes negotiations difficult between his group and the City of Glendale which owns Jobing.com Arena. Reinsdorf is seeking lease concessions from the city if he takes over the franchise for $148 million. * Postponement of the Aug. 5 Glendale-only auction of the team until September. * A ruling by the court that the team should play the 2009-10 season in Glendale. * Removal of Moyes and his attorneys from the sale process "so that there can be a fair and reasonable shot at getting a sale in Glendale." * Monetary sanctions against Moyes and his attorney. Moyes' attorneys have objected saying the first two issues already have been resolved and that the removal of Moyes would be excessive, because he did not review nor was he involved in the mistaken filing. The court has already delayed the auction. The bankruptcy court also learned this week that the Coyotes' largest creditor, SOF Investments, has a deal with Reinsdorf on how to handle$80 million in debt. The deal reportedly involves a substantial pay down along with a rollover of the balance. The firm, which is owned by computer mogul Michael Dell, says with the agreement and an adjustment of the building's lease, it would support the sale of the team to Reinsdorf. Meanwhile, Jim Balsillie, the man who wants to buy the Coyotes from Moyes for $212.5 million and move the team to Hamilton, Ontario, says Copps Coliseum can be ready to host the NHL team Oct. 10. Additional work would be needed to bring it up to league standards, but that is expected to be mostly complete for the 2010 season. Additional work would be planned for the 2011 season. Phoenix, Ariz. - Chicago White Sox owner Jerry Reinsdorf has dropped his bid to buy the Phoenix Coyotes. The bid has been replaced with one from the NHL that includes a provision that allows it to move the franchise. The Reinsdorf bid, which had been endorsed by both the NHL and the Coyotes' largest creditor, SOF Investments, fell apart when negotiations with the City of Glendale could not secure the necessary subsidies to make the club viable in Jobing.com Arena. It had earlier been reported that Reinsdorf was looking for $23 million in local subsidies annually. Reinsdorf blamed the breakdown on Coyotes owner Jerry Moyes, who entered into a deal to sell the club to Jim Balsillie for $212.5 million, the same day it was put into bankruptcy protection on May 5. Balsillie wants to move the franchise to Hamilton, Ontario, a move the NHL opposes. The only other bid is from a group known as Ice Edge Holdings LLC, which has pledged $150 million and plans to play some Coyotes home games in Saskatoon. The group said it had reached agreements with SOF Investments and has plans to more effectively use Wayne Gretzky, the Coyotes' coach and hockey legend. The NHL's plan is to buy the Coyotes out of the auction, then work toward selling them to a third party that would keep it in Phoenix, at least for the time being. Gaining control of the club through the auction would allow the NHL to place the Coyotes in the hands of an owner it wants, without the interference of a bankruptcy court. It would also allow the league to cut Balsillie out of the process. The NHL has unanimously rejected Balsillie as a potential owner and has argued the league's decisions on who owns its clubs and where they play cannot be overridden by a bankruptcy court. A bankruptcy auction will be held Sept. 10, but whether the NHL and Balsillie have a head-to-head showdown in court will be determined at a hearing. Among the issues to be settled by Judge Redfield T. Baum is whether Balsillie is a qualified bidder for the team. Baum held the hearing this week, but has not issued a decision. Officials in Glendale say they are intent on keeping the team at Jobing.com Arena. "We want to do what's best for the city. We don't want to give any money away," Vice Mayor Manny Martinez said. The vice mayor said he wouldn't support the city creating a special taxing district or adding a so-called escape clause to the lease, allowing a new team owner to relocate the Coyotes if the team kept bleeding money in a number of years. Phoenix, Ariz. - Bidder Jim Balsillie has increased his bid for the Phoenix Coyotes and is offering to buy out the team's lease for Jobing.com Arena in Glendale. Balsillie made the pledge in documents filed with the U.S. Bankruptcy Court. A judge is scheduled to determine this week of Balsillie's bid is honored and whether he can move the franchise to Hamilton, Ontario as his bid requires. Balsillie's firm, PSE Sports and Entertainment, will offer up to$50 million to Glendale as part of an amended bid for the team. PSE would then reduce its original $212.5 million bid by $20 million. The end result is an offer worth up to $242.5 million, but is still contingent on the ability to move the franchise to Hamilton. "PSE's offer acknowledges the city's significant damages, and provides a much greater recovery than the city would receive under the NHL's bid when the (Jobing.com Arena) lease is rejected at the end of the season, as is likely," Balsillie's lawyers wrote. The revised offer requires the city to accept the money in exchange for dropping its other claims before the court including any fees associated with PSE breaking the lease at Jobing.com Arena and moving the team to Hamilton. "PSE cannot force Glendale to sell its claims, of course, but is willing to buy them for $50 million," the PSE lawyers wrote. The amended offer also extends the deadline to complete the deal by a week from Sept. 14 to Sept. 21. The NHL would have 10 days following the agreement of the sale to appeal the court's ruling - if PSE wins the auction - which means the soonest the deal could close is Oct. 2. Further, if PSE wins the auction and the NHL appeals - as the league has vowed it will - PSE will put $25 million in an interest-bearing bank account "so that the unsecured creditors will recover the time-value of money when the court's decision is upheld." The NHL and PSE are expected to participate in the court-supervised auction, but before that can take place Judge Redfield T. Baum must rule on an NHL request to bar Balsillie's group from the proceedings. The NHL voted against approving Balsillie as an owner at a board of governors meeting in July, citing character and integrity issues, and believes the court should not impose an owner on the league. The NHL is willing to pay $140 million for the club, but plans to resell the team to a person or group favorable to the league. Ice Edge Holdings, a group of Canadian and U.S. businessmen, had offered $150 million for the team and keep it in Phoenix, and hoped to bring five regular season games and some playoff games each year to Saskatoon, but the firm has reportedly dropped out of the race. The latest PSE proposal supposes the Coyotes will have to play at least some games at Jobing.com Arena in Glendale this season and the $50 million is intended to in part offset the costs of game day operations as well as the lease-break fee when the team eventually moves. Originally, Balsillie wanted to relocate the team to Hamilton in time for the 2009-10 season - now less than a month away - but his lawyers told the court they would be amendable to moving the team either midway through this season or in time for the 2010-11 campaign. The new offer only guarantees Glendale $40 million as up to $10 million could be taken away depending on the relocation fee PSE will be ordered to pay if it wins. Balsillie's camp believes $11.2 million to $12.9 million is a reasonable fee for moving the club, while the NHL counters it should be between $101 million and $195 million. Current owner Jerry Moyes put the team in bankruptcy protection in May and is trying to recoup some of his losses. He claims to have lost upwards of $300 million since he first invested in the club in 2001. Glendale, Ariz. - Phoenix Coyotes owner Jerry Moyes this week sought to make his case directly to the Glendale City Council for the sale of his team to Jim Balsillie, but the council turned him away and voted to support the NHL's bid for the franchise. Balsillie wants to move the team to Hamilton, Ontario. The NHL hopes to keep the team in Glendale. Balsillie had announced in U.S. Bankruptcy Court last week that he would hand Glendale a $50 million check as compensation if he is allowed to relocate the Coyotes to Ontario. The bankruptcy judge asked Glendale officials to evaluate the proposal. Previously, Balsillie had offered the city $50 million minus a relocation fee due to the NHL and operating costs while the team prepared to leave. Balsillie's new offer would exclude the potentially multimillion-dollar relocation fee, amounting to much more for Glendale but far less than the city owes on Jobing.com Arena. The city has argued that the economic damage of losing the arena's anchor tenant could be as much as $500 million. Moyes said he had asked to be added to the council agenda but staff told him he was not scheduled and could not speak. Even if Balsillie is successful in buying the team, the Toronto Maple Leafs are expected to object under a claim that Hamilton is in its market area. That claim could get the attention of the Canadian Competition Bureau which said it might investigate if the Maple Leafs block the move. The Competition Bureau has weighed in on the NHL's business practices in the past. Last year, after it investigated Balsillie's failed bid to buy the Nashville Predators and move them to Hamilton, the bureau issued a statement that declared its confidence that "the NHL's policies are not anti-competitive." The investigation concluded that the relocation of an NHL team, according to the NHL's constitution, would require only a majority vote by the league's board of governors. "The NHL would not permit any single team to exercise a veto to prevent a franchise from entering into Southern Ontario," the statement read. However, in response to the NHL's assertions that relocation requires a majority vote by the league's board of governors, Maple Leaf Sports and Entertainment sent a letter dated Nov. 29, 2006, to NHL commissioner Gary Bettman claiming that the team holds a de facto veto. That letter was filed by Balsillie's lawyers with the court. "The Toronto Maple Leafs do not agree that the relocation of a club into their home territory would be subject to a majority vote. They continue to believe a unanimous vote would be required," the letter said. "The Maple Leafs ... reserve all rights to take whatever actions are necessary to protect their exclusive rights to their home territory." Phoenix, Ariz. - The Phoenix Coyotes' Canadian suitor, Jim Balsillie, has told a bankruptcy judge that if he is allowed to acquire the team, it will play most, if not all, of its 2009-10 season in Glendale. One of Balsillie's lawyers suggested, however, that the team could move to Hamilton, Ontario as soon as February. Balsillie also agreed to delay the closing on the sale to as late as June 30 and, if another buyer matches or exceeds his $140 million bid and agrees to keep the team in Glendale, he will step aside. The new buyer would also have to pay financing costs for the 2009 season. Another modification of the bid concerned the $50 million Balsillie has offered to Glendale to break the lease at Jobing.com Arena. Balsillie is willing to pay $25 million up front and not ask for a refund if the court later decides to allow someone else to buy the team. Lastly, Balsillie offered to post a bond sufficient to pay all of the creditors. But Balsillie still wants the NHL to pay for the team's losses (more than $60 million last season) if it stays in Glendale for one more season. Balsillie's offer was made in an emergency hearing to hear arguments about whether Judge Baum should force Coyotes owner Jerry Moyes, Balsillie, the NHL and the city of Glendale into mediation. Judge Baum seemed impressed by the first two new terms, telling one of the NHL's lawyers: "To an old bankruptcy judge, $25 million in cash no matter what happens seems like a big change." As for the third term of posting a bond, the judge said that was required under bankruptcy law anyway. The judge also suggested that he believed mediation would do no good as the city and league have hardened positions. Phoenix, Ariz. - Both bids for the NHL Coyotes have been rejected by a bankruptcy court judge in Phoenix meaning the team will play its upcoming season at the Jobing.com Arena in suburban Glendale. In his ruling, the judge left the door open for the NHL to alter its proposal so that the team could be sold to a private buyer, but Jim Balsillie, who hoped to buy the team and move it to Hamilton, Ontario, was shown the door. Balsillie had offered the higher bid along with a promise of $50 million to Glendale for breaking the arena lease. The court sidestepped Balsillie's argument that the NHL was blocking competition by attempting to keep the Coyotes out of territory that allegedly belongs to the Toronto Maple Leafs. Team owner Jerry Moyes, who sought the sale to Balsillie, has filed an antitrust case against the league. Because that suit is pending, the judge ruled the issue had not been fully litigated and he could not allow relocation without harming the NHL's interests. "This conclusion effectively is the end for the efforts for . . . Balsillie, Moyes and the Coyotes to force a sale and relocation of the hockey team based upon the claimed powers in (the Bankruptcy Code)," the judge's ruling said. Balsillie says he will not appeal. The ruling is a solid win for the NHL and other sports leagues which were concerned that their efforts to control the location and ownership of member teams could be threatened. The judge rejected the league's bid because it did not provide payment to all creditors - specifically Moyes and former coach and minority owner Wayne Gretzky. "It would be inherently unjust for this court to deprive them (Moyes and Gretzky) of their possible rightful share of any proceeds without first providing all involved a fair trial on their claims," the judge wrote. NHL deputy commissioner Bill Daly said the league will consider how to change its offer to satisfy the court's concerns. "It remains our goal to secure the long-term stability of the Coyotes in Glendale," he said. Moyes put the club into Chapter 11 protection on May 5, largely at the behest of Balsillie's lawyers, who convinced him to pursue the legal strategy of using the bankruptcy court to sell the club. Glendale has spent $2.1 million on outside consultants to keep the Phoenix Coyotes in the Valley, public records show. In the past year, the National Hockey League team's hometown used the money on two legal firms, three sports-business experts and a media spokesman, trying to protect the city's investment in Jobing.com Arena, which the city built. Glendale officials say the high cost of top advisers was necessary to avoid the larger financial setback of losing the team. The Coyotes filed for bankruptcy in May, and a buyer wanted to move the team to Canada. The city told a Bankruptcy Court judge it could lose $500 million if the team left. Glendale, Ariz. - The battle between the NHL and Coyotes owner Jerry Moyes appears to be headed for resolution with the league buying the franchise. The move is expected to save the team from further bankruptcy proceedings. The court must approve the sale. Once it becomes the owner, which could happen as soon as Monday, the leagues is expected to sell the team to a new owner who will pledge to keep the Coyotes at Jobing.com Arena. That sale is not expected to happen immediately. The league has been covering the Coyotes' operating losses since last fall but will get to pay itself back out of its $140 million bid to buy the team. That means the amount of money from the sale available to pay off other creditors is being chipped away as the team's losses and the league's interim funding continue to mount. The league expects to inject an additional $2.6 million into the franchise by this week to meet payroll. By the end of next week, nearly $2 million more will be needed, which pushed all sides to make a deal. The Coyotes' future has been uncertain since last month, when Judge Redfield T. Baum rejected the two competing bids for the team, from BlackBerry co-CEO Jim Balsillie and the NHL. Balsillie had offered $212.5 million to buy and move the team to Canada. Baum rejected that offer because the NHL objected to Balsillie as an owner and had not signed off on relocation. Baum invited the NHL to tweak its $140 million offer, which he rejected because it discriminated against creditors, paying everyone except Moyes and minority owner and former coach Wayne Gretzky. Under the NHL offer, the league would use as much as $11.5 million to purchase 100 percent of the claims of contractors at Jobing.com Arena, as well as to pay debts owed to Glendale, which built the hockey arena. The remaining $128.5 million would go into the Coyotes estate, paying $79.7 million to SOF Investment, the largest secured creditor, and about $37 million to the league to repay its temporary financing of the team. Once attorneys' and administrative fees are paid, it's likely that less than $10 million would be available to pay the two remaining creditors: Moyes, whose claim sits at $104 million, and Gretzky, whose claim attorneys pegged at $9.3 million. Without naming names, Deputy NHL Commissioner Bill Daly said there are people who have expressed interest in the club. The league has said it will look for a local buyer at least through this season. Glendale also has an interest in the team staying. It is counting on the Coyotes to continue their 30-year lease on the publicly financed arena. Glendale, Ariz. - The soon-to-be new owner of the Phoenix Coyotes, the NHL, will soon sit down with the City of Glendale to ask for help in finding a new local owner for the team. Those talks are expected to explore the city's position on the Jobing.com Arena lease. Deputy Commissioner Bill Daly said the meeting is about how to move forward. It is not to open talks on re-working the team's 30-year lease at the city-owned arena, although the NHL has said all along that the lease will need to be re-worked. Daly called Glendale "allies" who are receptive to changes that don't hinder its ability to pay off the $182 million it poured into the arena. Daly played down the NHL's Dec. 31 deadline to give exclusive priority to local buyers. The NHL had to weigh contingencies should a local buyer not be found and the team need to relocate next season, he said. Among the contingencies is an out clause that rolls around July 1. "And again, we hope we never get to that point," Daly said. NHL Commissioner Gary Bettman said he hopes to find local buyers by the end of the season. Local buyers will get exclusive negotiating rights until the end of the year, but Bettman indicated there could be flexibility if more time is needed to complete talks. The NHL spent $140 million to purchase the Coyotes at auction after former owner Jerry Moyes placed the team into bankruptcy. A new owner is likely to seek a re-worked agreement with Glendale, which has a 30-year lease for the team to play at Jobing.com Arena. Moyes said he lost more than $300 million during his eight-year ownership tenure. Glendale leaders have been open to talks, but maintained the city would not forfeit revenue it uses to pay off its $182 million arena investment. The commissioner said he did not expect the NHL would be the one to re-negotiate the lease. Bettman said half a dozen potential buyers have come forward with interest in the Coyotes in Glendale. As for the sparse crowds that have plagued the team so far this season, Bettman said the sale to a permanent owner would turn that around. Glendale, Ariz. - A Montreal businessman is interested in acquiring the NHL Coyotes and keeping the team at Jobing.com Arena in Glendale. The team is owned by the NHL which is looking for a buyer who will keep the team in Arizona. Steve Stotland and others in the Camelback Hockey Group have been reviewing data on the team for the better part of this month, Coyotes President Doug Moss said. "They seem enthusiastic and serious," Moss said. Stotland said he is organizing the group with yet-undisclosed Valley investors. The Montreal native, who specializes in mergers and acquisitions of companies, said his experience has been in turning companies around. "I've always been an individual that's liked the challenges of the underdog," he said. He likens the Coyotes to the Pittsburgh Penguins, who went from bankruptcy in the 1990s to the Stanley Cup last spring. Stotland met with Commissioner Gary Bettman shortly after the NHL purchased the team on Nov. 2. He was a familiar name to the NHL, as he had negotiated in 2000 to buy the Montreal Canadiens, which was eventually sold to another buyer. Stotland said he planned to contact Glendale City Manager Ed Beasley to get talks with the city rolling. "The city of Glendale holds the key to the deal" with a "fair and equitable" lease, he said. The NHL is prepared to help new owners with "a fair share of revenue-sharing dollars," Stotland said. He hopes to close a sale early in 2010. Glendale, Ariz. - A special taxing district in the area around Jobing.com Arena could provide the revenue the Phoenix Coyotes need to be successful in Glendale, but the idea barely got out of the gate before it was shut down. The Arizona legislature is reviewing a bill that would allow Glendale to create a special taxing district within a 2-mile radius of the arena, excluding University of Phoenix Stadium, but Rep Jerry Weiers, sponsor of the bill, said opposition was so strong that it was unlikely the bill would move forward. The proposal to allow special taxing districts around enclosed, city-owned professional sports arenas could be used around U.S. Airways Center in Phoenix too. Weiers and Glendale's lobbyist say the measure is about holding onto the Coyotes, the hockey franchise that was nearly whisked to Canada amid bankruptcy proceedings last year. Opponents said it was about bailing out a company. The National Hockey League purchased and brought the team out of bankruptcy in September. The league continues in talks to sell the team to Ice Edge Holdings, although that deal is not yet sealed. The special district's sales tax revenue would not go directly to the team, Glendale lobbyist Brent Stoddard said. He added that the measure does not yet define what percentage of state sales tax revenues in such a district would go to the arena's home city. Weiers' strike amendment would allow a city to use the money for maintenance and operations expenses of the sports facility or public infrastructure. That could benefit a Coyotes owner if the city then lowered the amount the team must pay for those items. Glendale officials have been mum on lease negotiations with Ice Edge. Such a taxing district could not be used for ballparks, as the bill qualifies that the sports facility must be enclosed. Glendale, Ariz. - The Glendale City Council is expected to vote Tuesday night on two potential leases for Jobing.com arena amidst reports that one of the bidders to buy the Coyotes may drop out. Glendale plans to release the memoranda of understanding with Ice Edge Holdings and a group headed by Chicago sports mogul Jerry Reinsdorf late Friday as part of the regularly scheduled council meeting agenda. That means the public will get a four-day window to read and comment on the agreements. Ice Edge reportedly would not include in its proposal five games in Saskatoon, Saskatchewan, as had been previously suggested to boost team revenue. But if the group of Canadian and American investors took ownership of the Coyotes and revenue stayed low, Ice Edge could come back to the council to ask for out-of-country games. Reinsdorf's proposal could include a different way to improve the team's bottom line. His group would seek to create a community-facilities district or other funding mechanism around the arena that could raise money in a variety of ways if team revenue did not increase, reports said. State statutes allow cities to form such districts to finance public infrastructure and enhanced services. The districts are independently governed and can sell bonds, levy taxes and special assessments, charge user fees and collect money in other ways. Reinsdorf also appears to be asking for an escape clause that would allow him to sell the team after a period of three to five years if the team were not making enough money, reports said. After the council votes, the team owners of the National Hockey League must approve a new owner. Deputy Commissioner Bill Daly would not comment on the timeline for that meeting. Meanwhile, reports in the Arizona Republic also say Ice Edge partner Daryl Jones said his group is on the brink of dropping out. He expressed frustration with the City of Glendale and a proposed memorandum of understanding that he labeled "major steps backward." Ice Edge Holdings officials earlier said its financing is in place. Time would seem to be of the essence, with the playoffs, which will include the Coyotes for the first time in eight years, beginning in mid-April and scheduling for the next season getting under way. Last May, as the NHL fought against a forced relocation of the team in U.S. Bankruptcy Court, the NHL's Daly told a judge that scheduling for the next season was too far along to move the team. When the NHL ended up purchasing the team at a bankruptcy auction last fall, the league indicated it would ask the judge at the end of June to reject the team's 30-year lease if a deal for permanent owners in Glendale couldn't be reached. The Glendale council met last week behind closed doors to get an update on Ice Edge's and Reinsdorf's proposals. Council members declined comment on the details of the confidential negotiations, but Mayor Elaine Scruggs said that any new lease would hold to the "original parameters that we set out and asked our city manager to negotiate with." Ice Edge has said it would not seek an escape clause or a city subsidy. But the group has said it could seek to play five games in Canada to bolster revenues. Disagreements over that issue is what is reportedly concerning Ice Edge officials. Glendale, Ariz. - The Glendale City Council has struck a deal with the Phoenix Coyotes that will keep the team in Jobing.com Arena for at least another season. The deal includes a pledge to pay the NHL up to $25 million if a permanent buyer for the team cannot be found. The league had hoped to sell the team to an investment group led by Chicago White Sox owner Jerry Reinsdorf, but that group withdrew. It then sought to restart talks with Ice Edge Holdings, a suitor it rejected earlier, but no deal could be reached before the city's planned vote. Although Ice Edge representatives said negotiations had hit a snag and media outlets had speculated that the Reinsdorf deal was dead, City Manager Ed Beasley confirmed ongoing talks with the two parties and said a lease agreement on Jobing.com Arena is expected by June 30. The NHL required the guarantee as it presses against a deadline to schedule next season's games. The league purchased the Coyotes out of bankruptcy in November, saying it would spend the season and through June looking for owners willing to keep the team in Glendale. NHL Deputy Commissioner Bill Daly called the guarantee an insurance policy, one he hopes the league doesn't have to collect on. "We have every expectation and hope that an ownership transaction will take place in the very near future," Daly said. Daly said the NHL, which must approve the new owner, could act on the city's recommendation within weeks. Glendale staffers said the financial guarantee to the NHL is not to cover the Coyotes' operating deficit next season, as had been reported. The city's definition of the guarantee is that it would go toward the cost to operate the arena as well as team operations. "It is a fee to the NHL to operate the arena and maintain the team," Beasley said. The city would have to pay an arena manager to book shows and promote the venue even if the team were to leave, he said. However, the fee cap of $25 million is close to the team's expected operating losses this past season. City officials said the guarantee would not come from city coffers. Rather, the money would be collected through user fees and taxes from a special taxing district that would be set up in and around the arena. Beasley said the district would be voluntary and include non-residential property owners who see the economic benefits of keeping the Coyotes and the fans it brings to the area at least 40 nights a year. If a permanent owner is found, the city's guarantee to the NHL will be moot. However, based on a preliminary arena deal approved last month with the Reinsdorf group, a special taxing district is expected to be part of any new lease agreement with a permanent team owner. Glendale spent $180 million to open the arena in 2003. The city pays that debt with revenues generated in and around the arena. Glendale, Ariz. - Glendale is providing few details about how it plans to guarantee $25 million to the NHL if a new buyer for the Phoenix Coyotes cannot be found. The city made the pledge in an effort to keep the franchise in Jobing.com Arena. The deal should keep the Coyotes in Glendale next season. But ownership remains a question as reports surface that a possible third bidder has emerged. Talks have stalled with two groups; an ownership group led by Chicago White Sox owner Jerry Reinsdorf and Ice Edge Holdings. The reports don't identify who the potential new bidder is. City officials say they're confident a new owner can be secured by June 30, which would make the city's guarantee with the NHL moot. But no documents have been made public to detail what the city would pay the league for, or exactly how the city plans to generate the money for its guarantee. City officials said they are still in talks with NHL about the payments. As for how to raise the money, City Manager Ed Beasley said Glendale might implement user fees for eventgoers at Jobing.com Arena and form a special taxing district nearby. It would include commercial landowners, who volunteer to be part of the district to keep the team in Glendale. Elected officials and staffers said the NHL pledge would not tap city funds, although no written guarantee has been made available. The council would have to approve the taxing district if it moves forward. However, the deal to pay the NHL would not need to return for public review because the council authorized Beasley to enter the agreement. The issue is facing scrutiny from the Goldwater Institute, a taxpayer watchdog agency. The institute was inadvertently copied on an email from Glendale City Attorney Craig Tindall which advised the city staff to delay processing of an open records request filed by the institute. The Coyotes are in Chapter 11 bankruptcy reorganization, but made the playoffs for the first time since 2002 sparking a boost in attendance toward the end of the season. Glendale, Ariz. - The NHL has told the City of Glendale that it must find a buyer for the Coyotes by Dec. 31 or it will sell the franchise to a group that wants to move the team to another city. The league had been working to find a buyer for the team, but has not been able to secure a deal. The threat is included in the agreement between the NHL and the suburban Phoenix city in which the city agreed to pay up to $25 million of the Coyotes' operating losses for the 2010-11 season. There was no mention of the prospective buyer in the agreement, but the only buyers the NHL has admitted speaking to in connection with the Coyotes, aside from Jerry Reinsdorf and the Ice Edge group who both want to keep the Coyotes in Arizona, are Canadian billionaire David Thomson and Mark Chipman, the CEO of True North Sports and Entertainment, who own and operate the MTS Centre in Winnipeg. The agreement, says the NHL has a bona-fide offer from a viable purchaser who would relocate the hockey team to another market for the 2010-11 season and contemplates that the owners [the NHL] would break even on their investment in the team through the end of the 2009-10 NHL season as well as the NHL potentially receiving a relocation fee." Last October, the NHL bought the Coyotes in a U.S. Bankruptcy Court auction for $140 million. The league also admitted to spending $20 million to cover the team's losses for 2009-10 plus $10 million in the legal fight against BlackBerry billionaire Jim Balsillie's attempt to buy the Coyotes and move them to Hamilton. Even though Glendale officials managed to keep the team for at least one more season by agreeing to cover up to $25 million of next season's losses, the clock is now ticking on a move to Winnipeg, which lost the team to Phoenix in 1996. The agreement says the city has only until Dec. 31 to find a buyer willing to keep the team at Jobing.com Arena in Glendale. After that, the NHL says it can sell the team as it chooses. The only way Glendale can keep the team after Dec. 31 is if it finds a local buyer and the NHL has "not yet entered into an agreement to sell the team in a non-Glendale sale and the city identifies a prospective bona fide purchaser." Glendale's obligations to pay the Coyotes' losses begin July 1 and run until the team plays its last game of the 2010-11 season. The NHL also forced the city to sign an escrow agreement in which it will place $25 million in an escrow account with the Bank of America Merrill Lynch in Chicago or post a letter of credit so the league can begin drawing on it when the agreement begins. According to the agreement, the NHL can also sell the team to a local buyer before Dec. 31 but it also has the "absolute right to approve or disapprove any prospective purchases of the team." However, the overall impression of the agreement is that the responsibility of finding a local buyer now rests with the city. At this point, it is not known if there are any substantial negotiations between Glendale officials and either Reinsdorf or Ice Edge. Before Glendale city council voted to give Beasley the power to commit to an agreement with the NHL, talks with both parties broke off. Glendale hopes to cover its $25 million commitment by creating a special taxing district around Jobing.com Arena and through parking revenue. However, the agreement says if these efforts do not produce the necessary funds the city is responsible to make up the difference. Glendale, Ariz. - The city of Glendale has taken $25 million from accounts used for water and sewer services to satisfy an escrow fund promised to the NHL in exchange for keeping the Phoenix Coyotes at Jobing.com Arena. The NHL demanded that Glendale show its proof of funds or risk the team leaving immediately. The NHL owns the team, which it purchased for $140 million out of U.S. Bankruptcy Court last fall. "The NHL had a buyer on the table willing to pay $170 million for the team," city spokeswoman Julie Frisoni said. The buyer wanted to relocate the Coyotes to Canada next season, she said. Although Glendale planned to set up a special tax district or a funding mechanism to meet the $25 million obligation, the NHL's deadline made that impossible, city officials said. So the city dipped into its enterprise-fund investment account, which pays for long-term costs not anticipated to come due for several years. The city's enterprise account totaled $415 million for the fiscal year that will end June 30, according to an annual report. The money in the enterprise funds comes from fees paid by businesses and residents for public services such as trash, water and sewer, landfill and housing. The fund absorbs revenue shortfalls in enterprise departments, repays debt for capital projects and covers the cost of regulatory requirements, according to the city. Art Lynch, the city's former chief financial officer who now consults with Glendale, insisted that tapping into the enterprise fund is not using taxpayer dollars. It is a fee paid by residents and businesses who use city services. The city agreed to pay the NHL for "actual cash losses" the team and the arena management could start accruing in July. The agreement states that Glendale is off the hook if it finds a viable owner, approved by the NHL, by Dec. 31. Any city money paid out of the escrow account would be replenished by the new owner, Lynch said. City Manager Ed Beasley said the city is on track to submit a recommended buyer or buyers to the NHL by June 30. Glendale, Ariz. - With the withdrawal of a group led by Jerry Reinsdorf from bidding for ownership of the Phoenix Coyotes, the city of Glendale has decided to negotiate solely with Ice Edge Holdings. The Reinsdorf group did not indicate in a statement what derailed the deal. "Ultimately we came to the conclusion it was time to move on," the statement said. "We were happy to serve a critical role for the city to keep the team in Glendale and we look forward to assisting the city in the future on other projects both as a company and individually." Reinsdorf came forward as a potential buyer even before the team's bankruptcy that stretched across most of 2009. But the group pulled out before the auction in U.S. Bankruptcy Court, leaving the NHL to purchase the team. Reinsdorf later returned to the negotiating table, working out a preliminary lease agreement with the city in April. The NHL has given Glendale until Dec. 31 to complete an arena lease with a buyer willing to keep the team at Jobing.com Arena. After that, the league could relocate the team. The next Coyotes owner will have to win approval from the NHL board of governors, the group of league owners. It is possible that the league could reject the offer of Ice Edge, a group of American and Canadian investors. Other buyers could still come forward, as well. Glendale's preliminary agreement with Ice Edge differs only slightly from one rejected by the council in April. City officials at the time worried that the proposal held Glendale financially responsible if a special taxing district planned around the arena failed to generate as much money as expected. The new deal says both the district and the city will make sure the money comes through. The Ice Edge agreement calls for the community facilities district to raise revenue for the team. The district would charge fees to nearby landowners such as developer Steve Ellman, as well as collect ticket surcharges and parking fees for hockey games, concerts and other events. * Change the team name to Arizona Coyotes. * Allow Ice Edge to sell the team to a buyer keeping the team in Glendale if the taxing district failed to raise the required revenues in the first five years. * Allow five regular-season games to be played in another city. * Give Ice Edge the first opportunity to buy the arena if Glendale sold it. * Complete negotiations on final details by early August, and form the taxing district by early October. The Coyotes are critical to Glendale because the city uses payments from the team and sales taxes from the sports and entertainment area to pay off its $180 million investment to build the arena in 2003. The NHL bought the Coyotes out of bankruptcy last fall for $140 million. The city has guaranteed the league that it would pay up to $25 million to cover team losses until an owner is in place. Those expenses start accruing July 1. Glendale officials say the team owner would reimburse the city for those expenses, although such an arrangement does not appear in the recent agreement with Ice Edge. Glendale, Ariz. - The possible new owner of the Phoenix Coyotes, Ice Edge Holdings, believes it can work out a deal to buy the team and take over the lease at Jobing.com Arena by August. Ice Edge reached a preliminary arena deal with Glendale, which should pave the way for approval from the National Hockey League. Anthony LeBlanc, a Canadian who first pursued ownership of the team last summer and who moved to the Valley in January, is ready for the homestretch. LeBlanc is the company's chief executive. The businessmen behind Ice Edge plan to finance about half of the purchase with bank loans and the rest in cash from its partners and investors. Ice Edge must prove its financing to Glendale this week to keep the deal on track. The financing was in place in April as Ice Edge's first arena lease agreement went before the Glendale City Council, LeBlanc said. When the council rejected the lease, the bank's commitment was voided. With the new agreement in place, Ice Edge is working to re-establish bank financing. Ice Edge's plan calls for a special taxing district around the arena. The group would need approval from an adjacent outdoor shopping center to be part of the district. The taxing district would charge the center's owners and others to generate as much as $75 million over 10 years to offset team financial losses. Fans will also be asked to pay parking fees to generate $7.5 million per year and a ticket surcharge to generate $2 million annually. LeBlanc expects to make the team profitable in three years by cutting unnecessary expenses, adding revenue with more concerts and putting a winning team on the ice. The next steps for Ice Edge are to finalize an arena lease with Glendale and the asset purchase from the NHL. The council could vote to form the taxing district by June 22 and approve the final lease at a special meeting over the council's summer break in July and August. The final piece should be a vote by NHL team owners to approve the group as owners. Glendale, Ariz. - Ice Edge Holdings has satisfied requirements set out by the city of Glendale that back up its financial plans to buy the NHL Coyotes. "Ice Edge Holdings has submitted the appropriate documentation," Robert Johnson, an Ice Edge spokesman, said in a statement, "and now will begin its work with the city of Glendale" to reach a finalized lease agreement to play at city-owned Jobing.com Arena. A preliminary deal was struck with Glendale earlier this month. If Ice Edge had not met the deadline to reveal its financing, the city would have been allowed to re-open negotiations with any other group interested in buying the team. Glendale officials confirmed they had received "some of the required financial information" from Ice Edge. "The next step is for the city and independent financial advisors to review the financial information to verify it meets the requirements set by the city and directed by the council," spokeswoman Julie Watters wrote in a statement. Those requirements include verifying the "purchase of the team is fully funded," she said. A special taxing district around the arena and nearby shops is planned to generate as much as $7 million per year for Ice Edge to pay back its bank loans. Johnson could not confirm whether the financing would come from one bank or several, citing confidentiality agreements. The National Hockey League purchased the Coyotes out of bankruptcy last fall for $140 million. The league is expected to tack on the roughly $20 million operating losses racked up last season. Ice Edge must also secure approval from the NHL to take over the team. The NHL has given Glendale until Dec. 31 to complete an arena deal with a new owner. In exchange for the extra time, the city pledged $25 million to cover team losses until a buyer is in place. Glendale, Ariz. - The city of Glendale and a group looking to buy the Coyotes disagree over whether the terms of a deal have been met, according to the Arizona Republic. The debate is the latest in a series of negotiations between Glendale and at least two team bidders that have collapsed and resurfaced over a tortuous year for local hockey fans. The group of Canadian and American investors was required to show Glendale proof of its financing last month in order to negotiate exclusively with the city and work on a detailed lease for the Coyotes to play at city-owned Jobing.com Arena, the newspaper said. At the deadline, Glendale said Ice Edge Holdings had submitted "some of the required financial information." City officials declined public records requests for more detail. City spokeswoman Julie Frisoni told the Republic that Ice Edge has failed to submit some of the required documents, five weeks past the deadline. She would not elaborate on the missing files. Though the deadline for exclusivity is gone, Frisoni said, the city can still negotiate with Ice Edge. But the clock is ticking. The newspaper said the tentative agreement between Glendale and Ice Edge aimed to conclude negotiations Aug. 6. Ice Edge spokesman Robert Johnson told the Republic the group has not begun arena lease talks with Glendale because it would be "putting the cart before the horse," since the group has not yet bought the team from the NHL. But last month, when Ice Edge said it had submitted proof of financing, Johnson told the newspaper the group "now will begin its work with the city of Glendale to achieve expeditious completion of" the finalized arena lease. Johnson also disputes the city's claim that financing records are missing. "We have submitted the documents we believe meet the requirements regarding the state of our financing," he told the Republic. "We remain confident of our ability to buy the team from the NHL." Johnson declined to say whether Ice Edge had secured financial backing. Ice Edge CEO Anthony LeBlanc told the Republic in June that about half of the team purchase price would come from several of the group's partners and bank loans would cover the remainder. Johnson said the exclusivity agreement is "nice to have" but not necessary. Glendale, Ariz. - Other groups have reportedly entered the bidding for the Phoenix Coyotes, according to a report by Rogers Sportsnet.com. "There are others out there that are viable," Mike Nealy, who took over one month ago as the team's president, told the Arizona Republic. But such groups "like to stay quieter." The web site said one of those groups includes Jerry Reinsdorf, who has been sitting on the sidelines for the past few months while current bidder, Ice Edge Holdings, has tried to negotiate a lease and also prove it has the financing in place to own the NHL team. While the City of Glendale would not comment to Sportsnet on the developments, a City representative did say they stood by comments that Ice Edge was having difficulty proving they had enough financial backing to purchase the club. On a related topic, another source close to the team told Sportsnet that only 1,800 season tickets have been sold for the 2010-11 season. The City has agreed to pay the team's losses for the upcoming season, with a cap of $25 million, until a new owner is found, the web site reported. Glendale, Ariz. - An investigation by the Arizona Republic finds that Glendale is able to meet its debt obligations for sports facilities it is sponsoring, but long-term economic problems could pose challenges. "Glendale has collected enough money every year to pay for Jobing.com Arena except during the NHL lockout in 2005-06. The key will be to secure an owner so the team continues to generate revenue for the city to pay the debt," the newspaper said. "When it comes to spring-training baseball, the city is paying the debt with borrowed money and long-term repayment plans have been hampered by the down economy. �The risk factors aren't the same for the football stadium or USA Basketball, which were built or planned to be built without city cash for the most part," according to the Republic. The tourism tax revenues and a commercial project called Main Street that were suppose to pay the city's debt for the ballpark project have faltered, the newspaper said. By 2014, the loan that Glendale took out as reserve to pay baseball debt will be depleted. By 2018, the city will face a $15.2 million ballpark payment. The Republic said there's a question whether $9.4 million the city expected from tourism taxes collected by the Arizona Sports and Tourism Authority will materialize because of the recession. And Main Street has gone un-built. The developers, HB Equities, who did not return calls to the newspaper, continue to chase funding. City staff would provide no details to the Republic on their alternative plans to generate revenue to pay the debt. The City of Glendale is continuing talks with a newly-identified buyer for the NHL Coyotes, according to the Arizona Republic. City Manager Ed Beasley updated the City Council on progress with the new investor, Chicago businessman Matthew Hulsizer, CEO of options-trading firm PEAK6 Investments. The Republic said the goal is to schedule a council vote on Sept. 14. Glendale owns and leases Jobing.com Arena to the Coyotes to pay off the city's $180 million investment to build the hockey and concert venue in 2003. Any Coyotes buyer must reach a new lease deal with the city before seeking National Hockey League approval to take over the team. The NHL bought the team out of bankruptcy last fall for $140 million. Ice Edge Holdings, a group of American and Canadian investors now familiar to Valley sports fans, pursued the team for more than a year but ran into a disagreement with Glendale over proof of financing in July. If a local deal isn't secured, the league would consider relocating the franchise, which moved to the Valley from Winnipeg in 1996. Glendale, Ariz. - The NHL has given Glendale a deadline of Dec. 31 to find a new owner for the Coyotes or the league, which now has possession of the team, will begin looking for a buyer who could move the franchise out of Arizona, according to the Arizona Republic. Efforts to sell the team have been grueling, characterized by missed deadlines, failed negotiations and growing worries as the final cutoff for negotiations looms, the newspaper said. Three months remain to hash out a deal. If none materializes, the team is expected to return to Canada, leaving an arena largely paid for with city taxpayer money. Glendale worked for months on deals with two buyers only to see the plans disintegrate. The city even agreed to pay the NHL up to $25 million to cover team and arena operating losses this season to buy more time. Now a third possible buyer, Chicago investment trader Matthew Hulsizer, is in talks for the club. Glendale hopes the third suitor is the charm. The Coyotes' financial risk is likely more troubling to potential investors, considering the team's history, according to the Republic. Many NHL franchises lose money, but the Coyotes reportedly lost as much as $30 million each season after moving to the Valley from Winnipeg, Manitoba, in 1996, it was reported. The league has secured a backup deal with investors willing to pay more than market value to relocate the franchise to Winnipeg, Glendale Mayor Elaine Scruggs told the newspaper. 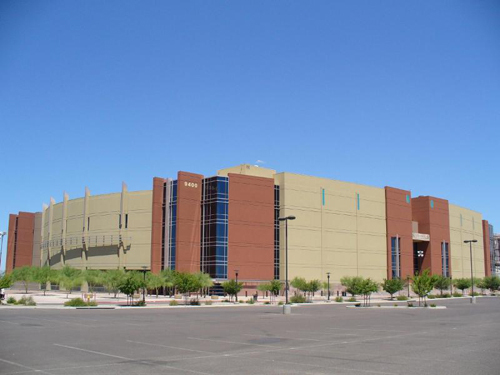 Glendale, Ariz. - The City of Glendale says it has an agreement in principle with Chicago investor Matthew Hulsizer on a new lease for the Phoenix Coyotes, according to several reports. Hulsizer is working to buy the team which is now under the control of the NHL. "The City and the Hulsizer group have an agreement in principle on a lease which would allow the Hulsizer group to buy the team from the National Hockey League (NHL) under the terms they requested," a statement on the city's web site said. "The proposed ownership transaction is subject to formal approval by the NHL Board of Governors." The NHL and Glendale say their preliminary agreements with Hulsizer are oral. Setting words to paper could present more challenges, the Arizona Republic reported. "We do not yet have a written agreement with Mr. Hulsizer and obviously we will need one to move this process forward," NHL Deputy Commissioner Bill Daly told the Republic. "We will also have to go through our due diligence and ownership approval process," including an in-person interview of Hulsizer by the executive committee of the board of governors, the 29 other league owners, and a boardwide vote to approve Hulsizer as an owner. Daly said the quickest the deal could happen is about six weeks, or early to mid-December. The NHL has long said that the Coyotes couldn't remain in Glendale unless there was a new lease for the team to play in Jobing.com Arena. Hulsizer is co-founder and chief executive officer of PEAK6 Investments. The Ice Edge group remains a part of Hulsizer's efforts to buy the team. Hulsizer emerged in the efforts to purchase the team by Ice Edge Holdings, another group that has been bidding for the team. Hulsizer is reportedly providing money for Ice Edge. The NHL and Glendale were concerned about the Ice Edge offer because it relied heavily on bank financing. Hulsizer came in and would be the majority owner if the purchase goes through, reports said. The league purchased the franchise when the previous owners went into bankruptcy with the stated intention of finding a buyer to keep the Coyotes in Arizona. The NHL has said it would look for buyers elsewhere if a deal were not reached by the end of the year. Glendale has deposited $25 million to cover losses for the franchise this season. Hulsizer's group also deposited $25 million in what was described as a demonstration of good faith. The Coyotes never have turned a profit since moving from Winnipeg in 1996. Glendale, Ariz. - The Arizona Republic reports that Glendale has struck a deal that would pay the Phoenix Coyotes' prospective buyer $197 million over the next five years, more than the city spent to build an arena for the team seven years ago. Chicago businessman Matthew Hulsizer would get $100 million, which Glendale will raise from a bond issue, as soon as the deal is signed. The city would then pay the Coyotes organization $97 million over five years to operate the arena during concerts and other non-hockey events, a cost that had previously been borne by the team. The city says it will charge parking fees at arena lots to help cover the cost of the $100 million in bonds, although it isn't clear that such fees alone will cover the debt, the Republic noted. The details were laid out in a proposed lease agreement for Glendale-owned Jobing.com Arena. After the city's approval, NHL Commissioner Gary Bettman promised the city an NHL All Star game sometime between 2012 and 2014. The Republic said the game would have provide up to $30 million in economic benefits to the area. The multimillion-dollar commitment is the latest in a series of moves the city has considered to keep hockey in Glendale as an 18-month drama over the team's ownership played out. Citing financial losses and unable to negotiate a better lease deal, former owner Jerry Moyes put the team into bankruptcy in May 2009. A string of other bidders negotiated with the National Hockey League and the city to take over the team. For a time, it seemed possible the Coyotes would be moved to Canada, the newspaper said. In the end, the league itself bought the team and kept it in Glendale. Now, Hulsizer plans to pay $170 million to buy the team from the NHL and is expected to use the city's $100 million to offset the cost. In exchange for the up-front payment, the Republic said Glendale will take over rights to 5,500 parking spaces in lots surrounding the arena. Use of those lots had previously been controlled by the Coyotes. The city plans to repay the debt by implementing arena-parking fees of $5 to $20 during hockey games, concerts and other events, as well as selling advertising and naming rights on the lots. The Republic said the deal aims to ensure Glendale has an anchor tenant for the taxpayer-funded arena until at least 2033. The city spent $180 million to build the facility in 2003 and depends on team and concert revenue to pay off the debt. * Glendale would pay Hulsizer $97 million over the next 51�2 years to manage the arena, schedule concerts and other non-hockey events. That cost previously has been picked up by the team. Glendale's annual payments would range from $10 million to $20 million. 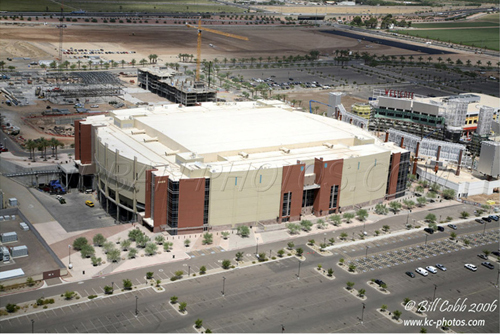 * After 51�2 years, Glendale could sell the arena to Hulsizer for no more than $130 million. If he isn't interested, the city could sell the arena to another buyer or renegotiate payments to Hulsizer to continue to operate the arena. The Coyotes would remain at the arena, even if the arena were sold. * At the end of the lease, Hulsizer could purchase the arena, as well as the rights to charge for arena parking, for $40 million. A point not addressed in the lease is $25 million the city put up earlier this year to cover team losses and arena expenses. Glendale officials believe the NHL may allow the city to keep the $25 million, which has so far gone untapped, the newspaper said. * Keep the team in Glendale for the next 23 years, the remaining time the city has on its lease with the team. That matches the term remaining on loans to build the arena. * Pay the same amount of arena rent and fees to Glendale as previous owners, as much as $6 million a year. * Work to rename the team the Arizona Coyotes. Glendale officials in a statement said securing "a long-term commitment to the community" from the Coyotes "is critical to the economic viability of the entire region." Glendale estimated losing the Coyotes could have a "devastating" economic impact to the area, which is also home to Westgate City Center and University of Phoenix Stadium. The city cited a 2008 economic study that said the Coyotes and the arena generated 750 jobs in Maricopa County, $20 million in annual wages and $4.5 million a year in indirect business taxes for Glendale, the county and state. Glendale, Ariz. - The Arizona Republic said the city of Glendale does not yet have money in hand to complete a deal with Matthew Hulsizer who wants to lease Jobing.com Arena for the Coyotes. Glendale plans to sell $100 million to $125 million in bonds, essentially taking on debt, to finance the deal. The money would buy Glendale the right to charge for arena parking, which city leaders say would pay off the debt. Hulsizer is expected to use the money and his own to buy the team from the National Hockey League, the newspaper said. Glendale needs to secure a bond interest rate of no more than 6 percent if the city is to pay off the debt with parking fees, according to the most optimistic parking study commissioned by the city. However, Glendale will pledge citywide excise-tax hauls, such as sales-tax revenue, to pay the bond debt if necessary. Glendale spokeswoman Julie Frisoni told the Republic the city will issue the bonds soon when the market is advantageous for the city. Municipal-bond experts offered the newspaper insight into what Glendale's bond issue might look like. They say the city's bonds are likely to sell. But they agreed it's bad timing. "There's a perfect storm hitting the muni market right now," said Todd Curtis, portfolio manager for Aquila Tax-Free Trust of Arizona. The municipal-bond market was flooded last month as a federal stimulus program was set to expire, injecting plenty of supply. And many investors aren't looking for long-term bond investments over fears of defaults and losing profits as today's recession-lowered yields creep higher later, the newspaper reported. Bottom line: Cities must offer higher interest rates now to attract investors, the newspaper said. Curtis said a 6 percent rate on tax-free bonds with a term of 25 to 30 years would "probably be good" for Glendale. "I don't know if it gets as high as 7 percent or not, but it might under today's conditions," he said. Three other bond experts said a 5 percent to 6 percent rate might be likely if Glendale gets a good bond rating from agencies such as Moody's Investors Service, based on current trading in Arizona. John McDermott, a broker for Stoever Glass & Co., a Wall Street secondary bond market trading firm, told the Republic the city's bonds would be "a very good issue" if the city gets an Aa3 rating as it has in the past. Glendale traditionally received high bond ratings due to a history of fast repayment and conservative borrowing. But Moody's has noted some concerns, most recently in November when Glendale issued bonds for a utilities project and another non-Coyotes-related undertaking. Moody's gave a "negative outlook," saying Glendale's overall debt burden is "fairly high" and "well in excess of national medians for all cities." The Coyotes "transaction would likely further increase the city's debt burden," the report said. Glendale, Ariz. - The Arizona Republic says Moody's Investors Service has downgraded Glendale's bond rating, citing the city's high debt and financial challenges brought about by the economy. The ratings are a blow to Glendale, as the city seeks to secure financing to finalize a deal to keep the Phoenix Coyotes at Jobing.com Arena. The ratings are among the highest a city can get but lower than Glendale's previous ratings, the newspaper said. The downgrade affects $815.6 million of Glendale's current debt, as well as the $116 million in bonds that the city intends to sell this week, according to the report. Moody's dropped the ratings on the city's outstanding debt by one level. Ratings fell from Aa1 to Aa2 for general obligation bonds. Glendale received an A1 rating for the bonds the city will use to finance its deal with Coyotes buyer Matthew Hulsizer. Moody's said Glendale has adequate, if narrow, debt service coverage for the Coyotes bonds, but warns of potential legal challenges by the watchdog Goldwater Institute, the Republic said. Glendale, Ariz. - Glendale is considering a lawsuit against the Goldwater Institute for interfering in its deal with the Phoenix Coyotes, Mayor Elaine Scruggs confirmed to the Arizona Republic. City officials say no action is imminent. The City Council has authorized City Attorney Craig Tindall to file suit against the conservative watchdog group, she told the newspaper. The suit is seen as possibly Glendale's last option to get Goldwater to drop its opposition to the deal, which would keep the team at the city's Jobing.com Arena for the next 30 years. Goldwater's Chief Executive Darcy Olsen said in a statement that the group's effort to determine the legality of the city's deal is in the public interest and protected by the right to free speech. "If this behavior can be subject to a retaliatory lawsuit by a legion of government attorneys," Olsen said, "then journalists, bloggers, and regular citizens across the state are all at risk." NHL officials told Yahoo Sports that the proposed lawsuit won't affect plans to sell the Coyotes. "I don't anticipate a lawsuit brought by Glendale (to the extent one is filed) will ultimately have any impact on how the franchise issue plays out," NHL deputy commissioner Bill Daly told Yahoo. But a day later, NHL Commissioner Gary Bettman laid blame on the Goldwater Institute, saying they had obstructed Glendale by threatening to sue to block the deal. "It's time for Goldwater to stand down," he said. "In light of their conduct in this matter, I question whether this is really an organization concerned with the public interest." Bettman said that at some point, if the Coyotes situation isn't resolved, the league will have to move the team. If it acts, the city is expected to sue for significant damages, a source close to the deal told the Republic, potentially as much as $500 million, the amount of economic impact Glendale estimates it would lose if the NHL team left for Canada. The lawsuit would revolve around Goldwater attorney Carrie Ann Sitren's letters to bond rating agencies and underwriters in January notifying them that Goldwater was looking into potential litigation to block the city's agreement, sources knowledgeable about the deal said. The Republic said the letters indicated Goldwater had not made a final decision but that Glendale's deal could amount to an illegal government subsidy of private business. Glendale has been trying to sell $116 million in bonds to finance part of its deal with Chicago investor Matthew Hulsizer, who wants to purchase the franchise from the NHL. The team has struggled financially for years, but its role as an anchor tenant at the arena is seen as vital to the city's sports and entertainment district. The Republic said Glendale blames the institute's threat of legal action for spooking investors and driving up the city's borrowing costs. The city could face $100 million in added interest costs because of the group, according to Hulsizer. The Coyotes and Jobing.com Arena have lost $40 million this season, team buyer Matthew Hulsizer told the newspaper, although team officials say a typical end-of-season bounce should lessen that. Team officials also point to positive signs in ticket sales. But as it stands, the losses have pushed up Hulsizer's purchase price to $210 million. The newspaper said the National Hockey League, the team's current owner, intends to lose no money on the sale. The NHL tacked team and arena losses onto the $140 million purchase price, which is what the league paid to take the team out of bankruptcy in late 2009. The team lost about $30 million last season, the newspaper said. The Chicago investor said he's willing to pay those losses if the team sale goes through. "We love hockey, and I really love Arizona," Hulsizer recently told the Republic. "I'm inheriting a terrible problem, but I really like hockey. And I feel like we can make a few tweaks, and we can make a pretty good go of it." Already Coyotes President Mike Nealy notes improvements. Despite ownership uncertainty and the NHL tightening the team's front-office budget this season, the Coyotes made gains in ticket sales, ticket revenue and overall revenue per game, according to league statistics dated last month obtained by the Republic. The Coyotes remain second to last among NHL teams in average attendance at 11,434 per game, according to team-announced figures, which include complimentary tickets. However, the number of free tickets doled out this season has dropped by 36 percent from last year, according to the league statistics. The team has sold an average of 1,188 more paid tickets per game this season. Glendale, Ariz. - The Goldwater Institute says it will sue Glendale, claiming the city's hockey deal with the NHL Coyotes would illegally subsidize a private business and put taxpayers at risk, the Arizona Republic reported. The Phoenix watchdog group says it won't file the suit until Glendale completes the deal with Phoenix Coyotes buyer Matthew Hulsizer. The institute has pressed Glendale to restructure the deal so that Hulsizer bears more risk. In return, the institute has faced political pressure to back off as its threats have made it difficult for Glendale to secure financing to seal the deal. On the one hand, prospective bond-buyers now more clearly know what to expect. The city may find investors willing to take the risk of a lawsuit at a higher interest rate. Or the announcement could scare off investors and foil the deal. The city has restarted its effort to find buyers for the bonds, but so far, the interest rates offered have been higher than the city wants to pay. Reports say investors have been seeking a nine percent return. Glendale wants to sell bonds to pay Hulsizer $100 million. In return, the city would get the right to charge for parking during Jobing.com Arena events to pay part of the bond debt. The city also would pay Hulsizer $97 million over the next five years to manage the arena and negotiate further payments later. The agreement would keep the Coyotes in Glendale through 2041. Hulsizer would pay Glendale millions in arena rent and other fees, share revenue if the team made a profit and purchase the arena at the end of the lease for at least $40 million. Glendale Mayor Elaine Scruggs has said the deal would stave off a $500 million economic loss to the city should the team leave. Glendale touts opinions by the city attorney and two Valley law firms that the deal is legal, the Republic said. The National Hockey League, which owns the team it bought out of bankruptcy in November 2009, downplayed the announcement. "From our perspective, Goldwater's announcement doesn't change a thing," Deputy Commissioner Bill Daly told the Republic. "We are still pursuing a sale of the bonds. Hopefully, the announcement will not negatively affect that." The institute charges the deal violates the state Constitution's gift clause in two ways. The group says the city is providing its credit to pay Hulsizer money he will then use to buy the team from the NHL. As a result, the city's credit rating dipped with the latest bond offering. Further, the institute says Glendale would pay more than it would receive from Hulsizer. "The deal poses enormous risks to Glendale taxpayers, who will have to repay the bonds if the team fails again or if parking revenues are insufficient to repay the bonds," Goldwater's statement said. The city pledged to bond-buyers it would use sales taxes to pay the debt if parking fees and other revenues are not enough. Phoenix, Ariz. - Prospective Coyotes buyer Matthew Hulsizer has offered the City of Glendale a new deal in hopes of heading off a lawsuit threatened by a taxpayer watchdog group that could derail the sale of the team, the Arizona Republic reported. Hulsizer told the Republic he notified the Goldwater Institute he would guarantee the team will pay Glendale at least $100 million during its lease on the city's Jobing.com Arena through $75 million in team rent and fees and by covering $25 million in team losses that the city promised to pay the NHL this season, which is included in the team's purchase price. The Institute is the group that has said it will sue if the deal, as it was proposed, goes through. The Institute says Glendale is violating the Arizona Constitution by paying more to a private business than the city would receive in benefit and is putting taxpayers at risk. The team rent and fees are already in the lease approved by Glendale and Hulsizer in December. But the amounts were not guaranteed. Glendale uses much of that money to pay off its original debt to build the arena. Glendale's total cost to finance the Hulsizer deal could total $250 million to $340 million when counting bond interest, which the city hopes to pay back in part by charging for parking during arena events, the newspaper said. In addition, Glendale would pay Hulsizer $97 million for arena management over five years and negotiate future payments. Hulsizer would share profits with the city if the team made money and buy the arena for at least $40 million at the end of the lease. Glendale, Ariz. - An analysis of a proposed deal between Glendale and the prospective buyers of the Phoenix Coyotes by the Arizona Republic shows the deal would be good for the city. The Republic used interviews and dozens of documents, including city commissioned studies, to examine the money at stake. The analysis shows that keeping the team is expected to be an economic benefit to Glendale if its studies pan out. Those benefits would shrink if assumptions used by the city and its consultants fall short. The studies are crucial since much of the city's revenue in the hockey deal is based on fluctuating variables, such as attendance or city sales-tax earnings at Westgate City Center. That contrasts with fixed amounts the city agreed to pay the team, including $197 million for arena management and parking rights over five years, the newspaper said. Timothy James, director of research and consulting at the W. P. Carey School of Business at Arizona State University, cautioned the newspaper that economic projections often are overly optimistic. Glendale spokeswoman Julie Frisoni said the city studies are conservative and that benefits to the city would grow if reality beats expectations. A representative of potential team owner Matthew Hulsizer said the deal would be even better for taxpayers than the Republic's analysis found. The Republic analysis shows the city would, under a lower scenario, turn an $87 million surplus in today's dollars, and under a higher scenario, turn a $136 million surplus in today's dollars. Both scenarios cover the 30-year lease at city-owned Jobing.com Arena. The lower and higher scenarios are because consultants differ on projections for a sizable chunk of the city's anticipated revenue: how much the city would collect in parking fees. A key piece of the deal is that the city will pay Hulsizer for the right to charge for parking at arena events. The Republic's analysis drew on figures from Glendale's budget, city statements, consultant studies and city agreements with Westgate City Center and Hulsizer. The analysis also assumed Glendale would obtain an interest rate of 6 percent on bond borrowing for the deal. ASU's James, who is versed in analyzing the economic impact of public investment in infrastructure, advised the Republic on its analysis. He said he has no ties to Glendale or The Goldwater Institute, which has threatened to challenge the deal in court. * The Coyotes and the arena would turn a profit by 2012. Glendale is banking on a profit-sharing agreement in the lease, but the team has lost money since it moved to the Valley in 1996. * Glendale would make $3 million in today's dollars over 30 years from selling naming rights and ads in the arena parking lot. James believes that it will be less. * Westgate will boom in two years due to the recovering economy, dramatically boosting sales-tax revenue for Glendale. A study shows Westgate sales-tax earnings soaring 72 percent between 2012 and 2013 and rising more steadily after that. James believes that the anticipated growth is overstated. * On the cost side, arena repairs that Glendale would pay are expected to reach $11 million in today's dollars over 30 years. James believes that the costs will be higher. "There's an awful lot of optimism bias," James said. "If any of those (projections) don't work out the way they want them to, the city's in big trouble." The newspaper said other problems could emerge if Glendale's bond sale goes off track. City officials planned for a 6 percent interest rate but now warn that the rate could go higher because Goldwater plans to sue to block the deal. If the bonds turn out to be more expensive for Glendale, it would throw off the projections. Glendale officials said the Republic's analysis demonstrates what the city has said all along, that it's better to keep the Coyotes than to let them go. Frisoni said city consultants don't have an "optimism bias." Rather, they're conservative. "The city has brought in the top financial experts who have advised us in the past very ably," she told the newspaper. However, projections by some of the same consultants for the original Coyotes deal have turned out to be more optimistic than realistic. For instance, consultants projected the city would collect $23 million in the 2009-10 budget year from sports-district sales taxes and some team fees. In reality, Glendale collected about half that. Frisoni noted that since the arena opened the city has faced an NHL lockout that cancelled the 2004-05 season, the team bankruptcy and a recession. Even so, the city made its payments on the arena using sports-district sales taxes and team fees, except for the strike year, she said. Brad Goldberg, vice chairman of Hulsizer's purchase group, said the deal is even better than ASU's James shows. For example, he disagrees with the calculation of the bond costs. The Republic ran the analysis using Goldberg's approach. It shows the city would make significantly more money over 30 years. Under the lower scenario, Glendale would turn a $184 million surplus in today's dollars and, under the higher scenario, turn a $233 million surplus in today's dollars. Goldberg's approach calculated the city's bond debt as the yearly debt payments Glendale would make over 30 years. James said the bond debt should be calculated as a lump-sum principal payment in the first year when the city pays Hulsizer the proceeds from the bonds, plus yearly interest payments over 30 years. Goldberg also argued the analysis did not accurately reflect the benefit to Glendale from Hulsizer covering $25 million the city pledged to the National Hockey League to cover team losses this season. Glendale agreed to pay the NHL from a utilities account to gain more time to negotiate with buyers. Hulsizer has said he would cover that. Goldberg argues the $25 million reimbursement should be viewed as revenue to Glendale. James said it should be counted as zero, since the city would receive no net new revenue. Critics like Goldwater President Darcy Olsen argue that it's faulty to assume the team will stay. She told the Republic there's no guarantee the Coyotes would remain for the full lease. She pointed to the team's money-losing streak and bankruptcy in 2009 that raised the specter of relocation. Olsen also questioned Glendale's argument that the city could not fully replace the Coyotes with other activities. The city contends that its lease with Hulsizer is bankruptcy-proof with provisions to prevent the team from leaving. City leaders have repeatedly referred to the loss of more than $500 million in sales-tax revenue and team fees should the Coyotes leave. But that figure assumes all city sales-tax earnings at Westgate and the arena would fall to zero if the team left. There's no doubt Coyotes fans frequent the outdoor dining-and-shopping complex, but the city has completed no survey of how many Westgate patrons also come for football games, movies, concerts and dining, the newspaper said. James said sales taxes could dip but wouldn't be demolished. "People will still spend money. They'll just spend it on other things," the ASU professor said. Whether the team stays or goes, Glendale must pay off millions in debt from building the arena. If the consultants' projections are correct about the value of keeping the Coyotes, Glendale could be worse off by losing the team. The Republic said even the skeptical James called that the "nuclear option." He said neither option looks great for the city, but the team leaving appears to "pose a much bigger problem." The position was supported by a report in the Toronto Globe and Mail which said a survey of several current and former NHL governors - who would not speak on the record to the newspaper because commissioner Gary Bettman frowns on public discussions of league business - highlighted the league's need to keep the Phoenix market (the 12th-largest in the United States, according to Nielsen Media Research) in order to maximize a U.S. TV contract. Glendale, Ariz. - A lengthy meeting between Glendale and the Goldwater Institute to resolve differences over a new ownership deal for the Phoenix Coyotes ended without a resolution, the Arizona Republic reported. Meanwhile, the NHL has given Glendale a Monday deadline to pay $25 million to cover team losses for the 2010-11 season. The Republic said the league told the city actual that losses were $36.6 million. Glendale promised the NHL last year that it would set aside $25 million from a utilities repair account to pay team losses in exchange for more time to land a team owner. Glendale officials promised taxpayers at the time that the city would not have to pay the money if it found a buyer. Later, officials said the buyer would cover the expense, the newspaper reported. The dispute with Goldwater is among the reasons that a deal has not closed. Goldwater, a conservative think-tank, opposes the city's deal with Chicago investor Matthew Hulsizer to buy the hockey team and has threatened legal action to block it, claiming the deal puts taxpayers at risk and is an illegal government subsidy to a private business. "The meeting was disappointing from our perspective," Clint Bolick, Goldwater's litigation director, told the Republic. "The mayor asked for our concerns and our ideas and we provided a number of concerns and ideas. The city did not seem to be open to the ideas we suggested and the city attorney repeatedly told us he would see us in court." Days after the meeting, the Toronto Globe and Mail said changes in the deal involve Hulsizer increasing the amount of money he and his partners will put into the purchase and the NHL reducing its asking price of $170 million or defer payment of the full price. In turn, this would allow Glendale to reduce the amount of the $116 million municipal bond sale that is to provide Hulsizer with much of the purchase price, perhaps by as much as half, to less than $60 million. One source told the Globe and Mail it could only be "a few days" before the success or failure of the latest 11th hour attempt to prevent the Coyotes from moving to Winnipeg will be known. Time is drawing short because the NHL needs to finalize a schedule for next season and another prospective owner, True North Sports and Entertainment Ltd., which wants to take the team to Winnipeg, also needs to know if it will have to move its American Hockey League team, the Manitoba Moose, out of the city. Under the original deal, Glendale would sell bonds to pay Hulsizer $100 million. The city would pay off the bonds in part by charging for parking during arena events. When asked if the NHL is willing to lower its asking price for the Coyotes and Hulsizer is willing to top up the $70 million he is putting into the deal, deputy commissioner Bill Daly said in an e-mail to the Globe and Mail that he disagreed with that "characterization." Daly also disputed the notion the deal is being revised to appease Goldwater: "Goldwater is not even a factor in this for us any more. We are not trying to structure a deal to satisfy them. We are trying to structure a deal that can close." However, even NHL commissioner Gary Bettman admitted Goldwater's opposition "chilled" the bond market. The bond issue stalled when it became clear the bonds would only sell at an interest rate too high for Glendale to afford, the Toronto paper said. Glendale Mayor Elaine Scruggs expressed concern to the Republic that Goldwater's actions will send a nationwide message to others looking to relocate to Arizona that economic development incentives cannot be trusted to be delivered, because they will be legally challenged at every step. "We believe we are not in violation of the gift clause," Scruggs said. She said it costs $20 million a year to operate the city-owned Jobing.com Arena, and without the revenues expected from bringing in a new Coyotes owner and keeping the team there, "we will have to absorb that cost." Goldwater put a number of suggestions on the table that would garner its approval on the deal, including having Hulsizer purchase the team with his own money or finding additional investors. The Republic said Hulsizer also attended part of the meeting, which ran nearly three hours. The National Hockey League currently owns the team, having bought it out of bankruptcy in 2009. It is waiting for a new owner to reach a deal to keep the team in Glendale. Otherwise, the team is likely to move to Canada. Glendale, Ariz. - The City of Glendale has offered the NHL up to $25 million to keep the Phoenix Coyotes in Jobing.com Arena for another year, giving the city more time to find a buyer for the franchise, the Arizona Republic reported. The City Council vote came during a meeting packed with an estimated 300 citizens upset about spending the additional funds. Glendale officials have argued the money is necessary to protect its investment in the sports and entertainment venue. The arrangement eases pressure on Glendale to complete a deal among the city, the NHL and a buyer. An agreement with Chicago businessman Matthew Hulsizer is still in limbo. Glendale recently paid $25 million it pledged the league a year ago in hopes of keeping the Coyotes in town until a permanent owner was found. The money for the first pledge came from a long-term utilities account. Glendale officials told the Republic they had not yet decided where they would pull the second $25 million from, but that the city has budgeted for it. The NHL says the team and arena lost $37 million last season. Glendale wants to keep its main tenant at Jobing.com Arena, which the city paid $180 million to open in 2003. The city is scheduled to pay off its bonds in 2033. Newly-released city documents argued that the city would have to pay someone to run the arena if the team left. City officials have said it would cost nearly that amount to manage the venue, according to the Republic. If Glendale reaches a deal before the end of next season, the amount of the city's pledge could diminish as a new owner would take on responsibility for team losses. Glendale worked out an arena lease in December with Hulsizer that aimed to keep the team in the West Valley suburb for 30 years. The city agreed to pay Hulsizer $197 million over five years and more down the line, while Hulsizer pledged other revenues to the city. The plan ground to a halt under scrutiny from a conservative watchdog group, the Goldwater Institute, over concerns the deal put taxpayers at risk and was an illegal subsidy of private business. Since then, Glendale publicly has pressured Goldwater to back down while it privately has sought to rework the deal. News of the planned vote on additional funds led minority-investor group Ice Edge Holdings to withdraw from the Hulsizer group. Anthony LeBlanc, who led Ice Edge in most of its negotiations with Glendale, told the Republic it was time for the group to move on. Ice Edge was an early bidder for the team with a goal of moving the franchise to Canada. The firm later dropped out and joined the Hulsizer group. Brad Goldberg, a spokesman for the Hulsizer group, told the Republic Ice Edge's departure would not hurt the deal with Glendale. Meanwhile, Moody's Investors Service has withdrawn its ratings on bonds that Glendale planned to sell for the Coyotes deal. The credit ratings agency withdrew its ratings because too much time elapsed without the bonds selling, spokesman Abbas Qasim, told the Republic. Glendale, Ariz. - Glendale is withholding a key economic report the city commissioned to persuade investors to finance its Phoenix Coyotes deal, according to the Arizona Republic. The report was prepared for the city's pitch to investors earlier this year when Glendale sought $116 million in financing from bond buyers. The money was needed to complete a 30-year lease at Jobing.com Arena with team buyer Matthew Hulsizer. The financing never came through, and the Coyotes deal remains in limbo. The TL Hocking & Associates report could shed light on assumptions the City Council relied on to approve the deal with Hulsizer last December. And it could provide insight into how much money Glendale is expected to reap by keeping the hockey team in town, the newspaper said. The Arizona Republic five weeks ago filed a request with Glendale under the state's public-records law for the study. The city denied the Republic's request three weeks later, saying the report was "protected" and it was "in the city's best interest not to release it." Glendale has made available other Coyotes-related records to The Republic by request and to the Goldwater Institute under court order. Glendale spokeswoman Julie Frisoni said the report could be important to future negotiations. A city may withhold records if their release "might lead to substantial and irreparable private or public harm" but must balance that against "the public's right to be informed about . . . its government," according to the state Ombudsman's Office. Glendale, Ariz. - The Arizona Republic says Glendale appears determined to find a new buyer for the Phoenix Coyotes in the next few months, but the withdrawal of Matthew Hulosizer as a potential buyer could make that more difficult. "I know the city's hope is to move forward toward a closing by the end of the summer," Bill Daly, deputy commissioner of the National Hockey League, told the newspaper. The Republic said Glendale and Hulsizer thought they had struck a deal six months ago when the city agreed to pay the Chicago businessman $197 million over five years. That would have helped Hulsizer pay the NHL's $170 million asking price. But the Goldwater Institute threatened a lawsuit, saying the deal amounted to an illegal subsidy. Hulsizer, a Chicago businessman and former college hockey player, continued to work with Glendale and Goldwater to reach a deal and pledged to keep the team in Arizona if his offer was approved. Glendale Mayor Elaine Scruggs told the newspaper that Hulsizer called council members early last week to emphasize his commitment and tell them he would abandon his deal if negotiations were opened to others. The Republic cited a source close to the deal said Hulsizer pulled out later in the week as the city invited other buyers to the negotiating table. The council heads to summer recess in July and is not scheduled to meet again until mid-August. "I am very hopeful that when we return from our break in August we will be hearing some good news," Clark said. Mayor Scruggs was less confident. "I think that the staff would very much like to have us come back to the news there was a deal done," she told the Republic. "That's an optimistic hope." The names of potential buyers other than Hulsizer have not been released, and Scruggs said that even she had not heard them. "That's the level of secrecy or confidentiality that we're talking about," she said. Glendale, Ariz. - The Arizona Republic says a Californian who has watched deals to buy the Phoenix Coyotes come and go from inside the National Hockey League may now buy the team. Greg Jamison, the former chief executive of the successful San Jose Sharks hockey team, is one of two bidders talking to Glendale and the league, the city confirmed. City officials said neither bid would have Glendale sell bonds, a lightning-rod that the Phoenix-based Goldwater Institute said amounted to an illegal subsidy. The city's last deal, with Chicago businessman Matthew Hulsizer, crumbled in June, months after the watchdog group threatened to sue. The newspaper said it's unclear when a deal could be inked with Jamison or another buyer. The regular hockey season opens in October and fans, who have been in limbo the past two seasons, are restless for resolution. One of the pressing issues will be whether a new owner will sign a long-term lease at the city-owned Jobing.com Arena. City spokeswoman Julie Frisoni would say only that Jamison is "adamant about keeping the team in Glendale." City officials referenced a second bidder but would not share details on the group. Whoever purchases the team must work out a purchase deal with the NHL and an arena lease with Glendale, which opened the arena eight years ago. The city's strategy to repay its $180 million arena debt was complicated in 2009 after former Coyotes owner Jerry Moyes filed the team into bankruptcy. The NHL stepped in as a temporary owner, and the city and the league have since sought a permanent owner. Jamison is a member of the NHL Board of Governors and serves on its 10-person executive committee. As word of Jamison's bid spread, fans and sports experts suggested the NHL veteran could be uniquely suited to turn the Coyotes franchise around. Jamison is part-owner and until last fall led day-to-day operations of the Sharks, counted by many as the most successful Sunbelt hockey team. Glendale, Ariz. - Glendale city staff told the Arizona Republic it was premature to come up with backup plans should the city lose the Phoenix Coyotes. Three months ago, Mayor Elaine Scruggs had asked staff to find out the city's cost to manage Jobing.com Arena if the hockey team was no longer the anchor tenant, as well as other possible revenue sources for the city-owned arena. Staff said a preliminary cost estimate for a consultant to do the study would range between $22,000 and $60,000 and take three to four months to complete. But Assistant City Manager Horatio Skeete told the City Council that potential team buyers and the National Hockey League said exploring other options could adversely affect the team's purchase. "We spoke to the potential purchasers of the team and the consensus was to go and begin actually pursuing that information would impact their ability to purchase the team," Skeete said. "They felt any suggestion from the city in the marketplace would hamper their ability to put together a deal." The NHL has temporarily owned the Coyotes since 2009. The city for the second year has pledged $25 million to the league to operate the arena until a new buyer can be found. The city is working with two possible team buyers, according to the newspaper. Councilwoman Joyce Clark told the Republic the city was in the midst of securing a new team owner and hiring a consultant to do an assessment would send the wrong message. She suggested that the city instead take up the issue in January, which was supported by council members Phil Lieberman and Norma Alvarez. The city has a self-imposed deadline to find a new team buyer by the end of the year. "We are very optimistic we will have an agreement and won't have to go though this," Vice Mayor Steve Frate said. Glendale, Ariz. - Former Arizona lawmaker John Kaites and Chicago sports magnate Jerry Reinsdorf are again looking to purchase the Phoenix Coyotes, the Arizona Republic said. Speculation about Reinsdorf's interest has been tossed around in recent months, but a spokesman for the group confirmed for the Republic that they are in talks with Glendale and the National Hockey League. Tony Tavares is also part of the group, Glendale Hockey LLC, according to David Leibowitz, the group's spokesman. Tavares is a longtime hockey and baseball executive who is interim president of the NHL Dallas Stars. Leibowitz could not provide details about the financial stake of each partner or other investors to the newspaper, although he said Kaites is the managing partner. The city and the NHL are working with a second group of potential buyers, as well. That investment group emerged last month, led by Greg Jamison, a former chief executive of the San Jose Sharks. Neither group has publicly discussed the structure of their bids. A Glendale spokeswoman has said the city would not need to sell bonds to finance either deal. That was a lightning rod earlier this year that led the Phoenix-based Goldwater Institute to threaten a lawsuit and caused a deal with another potential buyer to crumble. It remains unclear when a buyer could be chosen and a deal approved by the NHL and the City Council. A city spokeswoman told the Republic only that negotiations were continuing. Past bids by Reinsdorf and Kaites called for the creation of a special funding district at Glendale's sports-and-entertainment hub that would help fund the purchase of the team and cover operating losses. The 2010 bid included an opt-out clause that would have allowed Glendale Hockey LLC to move the team if financial losses continued. Lenders have repossessed a 33-acre retail and entertainment complex adjoining Glendale, Ariz.'s Jobing.com Arena after a failed foreclosure auction. The retail center known as Westgate City Center reverted to iStar Financial, a New York-based real estate investment trust, after failing to attract a minimum bid of $40 million the Arizona Republic reported. The minimum bid would have been less than half of iStar's $97.5 million loan for the facility. The company has not announced plans for the property. Glendale, Ariz. - Glendale's credit worthiness has eroded with the delays in selling the Phoenix Coyotes hockey franchise that plays at the city-owned arena. The Arizona Republic said Moody's Investors Service cited Glendale's large payouts to the National Hockey League as it downgraded the city's bond rating on a portion of its debt, about $680 million. The city has agreed to pay as much as $50 million to the NHL, the Coyotes temporary owner, for team and arena losses. Moody's said the NHL payment led to a serious drop in reserves in the general fund, which is the pot of money that pays for services from parks to police. The reserves declined from $38.8 million in fiscal year 2010 to $11.7 million last fiscal year. The ratings agency noted Glendale's debt burden relies significantly on excise tax revenues, which is the largest resource in the general fund. Moody's said the city's direct debt burden is "well in excess of medians for similarly rated peers." The downgrade was by one notch with some bonds going from Aa2 to Aa3, others going from Aa3 to A1, A1 to A2 and A2 to A3. Moody's rating scale runs from a high of Aaa to a low of C.
The downgrade came as the city this week began selling about $133 million in bonds to refinance debt and free up money. The ratings indicate the level of risk investors can expect to take on the bonds, which drives which bond buyers are interested as well as how high an interest rate the city must pay. The city's water and sewer bonds, which were not affected by the downgrade, sold for $78 million and did well, financial experts said. The city's $55 million in general obligation bonds, which the city had to sell for a higher interest cost because of the downgrade, struggled to be sold. "The deal is still in progress," said Todd Curtis, portfolio manager for Aquila Tax-Free Trust of Arizona. "That deal has struggled probably because of the downgrade and is probably costing the city." The question for investors is whether the Coyotes stay in Glendale, Curtis said. If the teams leaves, it would hurt Glendale's retail sales-tax collections, which back the general obligation debt, Curtis said. Moody's also revised the city's outlook from stable to negative, which means for the next 12 to 24 months there is a risk of another downgrade. Moody's noted the rating could further drop if the city continues to subsidize the hockey team's losses. Mark Tenenhaus, research director with RSW Investments in New Jersey, said the negative outlook should give cause for alarm because it's a signal more negative news could come. The city noted that Moody's cited the down economy as well as the Coyotes issue. The city highlighted the strengths Moody's noted: the large tax base relative to many similarly rated cities and the city's focus on reduced spending. There are three groups vying to buy the Phoenix Coyotes, NHL Commissioner Gary Bettman said on his weekly radio show. "There are probably three different groups that are taking a serious look at buying the Coyotes to keep them where they're located," Bettman said. Bettman did not provide further details on the third bidder. Former San Jose Sharks CEO Greg Jamison and Arizona lobbyist John Kaites have previously been reported to be leading groups interested in the team. Despite ongoing negotiations, Bettman said it's still possible the team could be moved outside Glendale. "We're going to try to avoid a move of the Coyotes, but if we don't sell the club, I'm not sure that this won't be the last season here," Bettman said. Glendale, Ariz. - Glendale City Council member Phil Lieberman is asking staff members to outline where the city will get the $5 million it needs to pay a debt to the National Hockey League, the Arizona Republic reported. Glendale pledged $25 million to the NHL, for the second year, to manage the hockey team and city-owned arena. The payment comes due at the end of the season in April. "We need to find the money now," Lieberman said. "We owe that." The city last year set aside $20 million in this year's budget with the intention of securing a team buyer who would pay the NHL tab. Sherry Schurhammer, management and budget director, said $20 million is in escrow and "we have to identify where the $5 million will come from and set up an inter-fund loan like in fiscal year 2011." For the first $25 million payout, paid last spring, the city borrowed the money from its self-sustaining enterprise funds for sanitation and landfill. These accounts are funded by user fees, such as use of the landfill or city sanitation services. The city plans to reimburse those accounts. The staff recently said the city would begin to reimburse the enterprise funds next fiscal year $1 million a year from the general fund. The staff has allocated $20 million in the draft budget for fiscal year 2012-13, which begins July 1, for the management of Jobing.com Arena. Schurhammer said the $20 million reflects the amount in the current-year budget. The exact cost to operate the arena is not known yet, but there will be a cost whether the team stays or goes, City Manager Ed Beasley said. Mayor Elaine Scruggs expressed frustration, saying it was well past time for the staff to provide a baseline cost to manage the arena, which she has asked for since last year. Scruggs has repeatedly called for a backup plan should the Coyotes leave Glendale, but her peers withheld support after the staff last fall said such a move was premature and could adversely affect the team's purchase. "I am not comfortable building the budget without knowing there is no other option or without knowing this is the full amount," Scruggs said. Beasley said that he spoke with NHL Deputy Commissioner Bill Daly and that Daly indicated negotiations were moving forward, and the commitment was to keep the team in Glendale. He also said the city staff in March will provide the cost for the city to manage the arena. Glendale borrowed $180 million to build the Coyotes' arena and makes annual debt payments of about $10 million. The city's ongoing saga with the team has drained city coffers, prompting Moody's Investors Services recently to downgrade some city bonds. Former San Jose Sharks chief executive officer Greg Jamison is now the only potential Phoenix Coyotes buyer who can negotiate with Glendale officials, the Arizona Republic reported. City Manager Ed Beasley, the city's chief negotiator, had said he had been working closely with Jamison and another unnamed group the past seven to 10 days. Mayor Elaine Scruggs later said the council instructed staff to continue negotiating with Jamison but not the second group. She said information on the latter group "does not meet the criteria set out by the Glendale City Council." The city manager has said that the council's direction has been to come to a lease agreement with a potential Coyotes buyer for the city-owned Jobing.com Arena that ensures the team stays in Glendale, doesn't negatively affect the city's budget or revenue streams and if possible, generates revenue for the city.